Visiting China required more planning than other destinations. 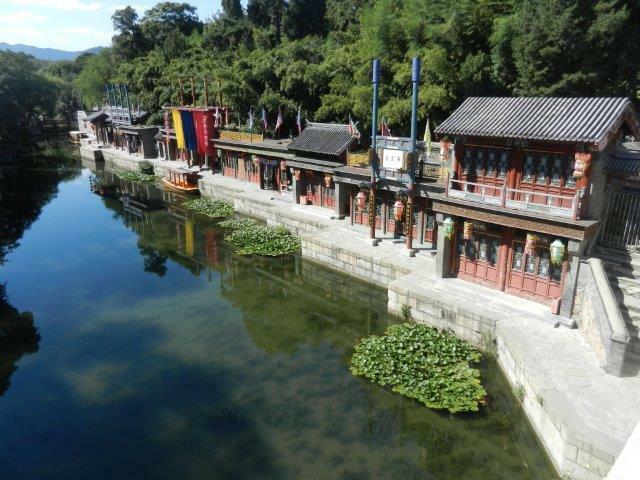 We started studying the Chinese language with Chinese Pod recordings in May. 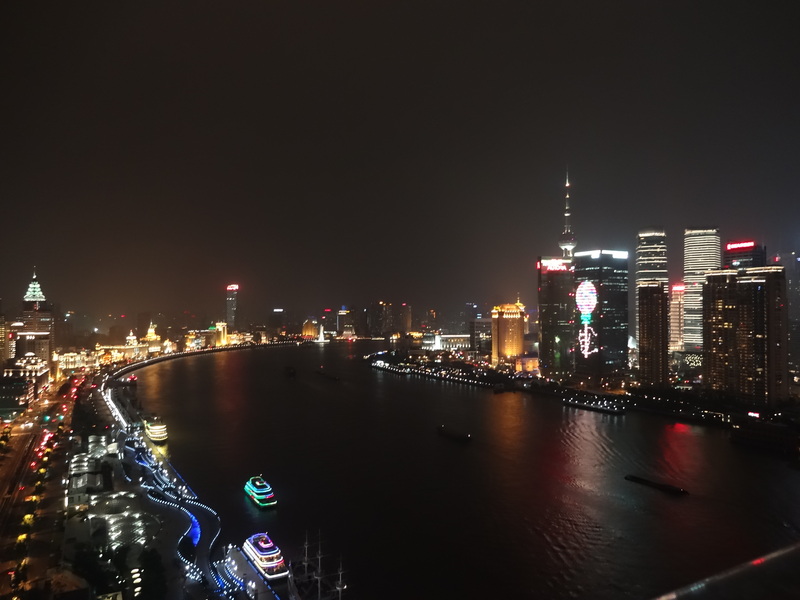 We needed to get visas from the Chinese consulate, but the visa form required that we have information about our flights and the hotels where we would be staying. We booked our tickets with Delta on June 22, made reservations with hotels, and sent off our visa applications by July 7. We started getting Chinese language tutoring on July 28 with _. We also bought a Pieco phone app to teach us as many words as possible and learn some Chinese characters. But learning Chinese was difficult. Our tutor told us the words we were trying to say sounded like different words to her, and she shifted into emergency tourist survival phrases. We typed up survival phrases and food words to keep on our cell phones. 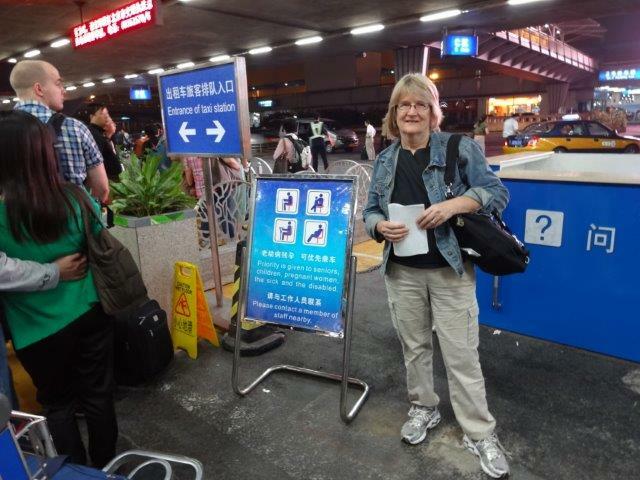 During the week before departure, we made Word notes for arrival in Beijing and for departure from Shanghai. We arranged for international internet access from Verizon, so we could use Google Maps to find our way around. I had an extra battery for the cell phone as well. In case the internet did not work, we also printed "taxi cards" for both cities, each containing the names of places we planned to visit in English and Chinese characters, maps, and public transportation information. Yet the more we tried to prepare, the more unprepared we felt. On Thursday, 9/13/12, we flew Delta flight 129 from Atlanta to Seattle. We were able to exchange some dollars for yuan in Atlanta. 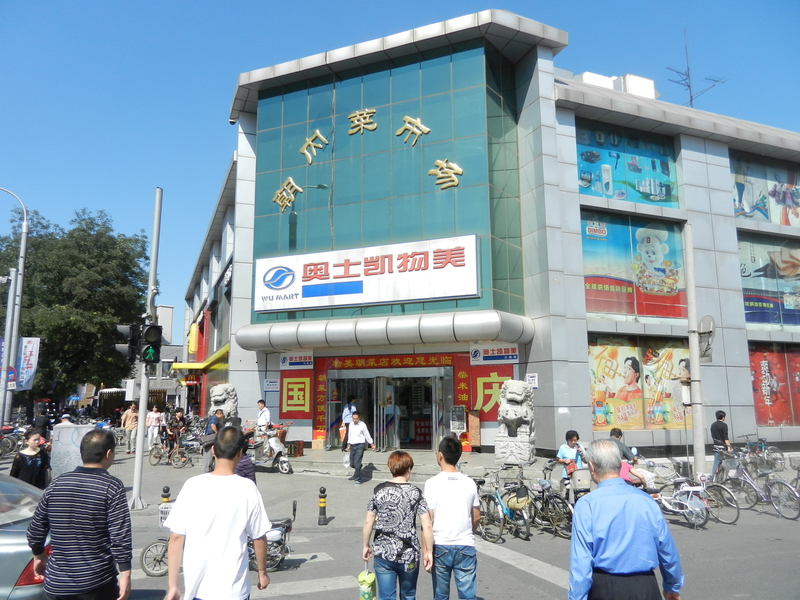 We probably paid too much, but we did not know if we would be able to find a bank or working ATM when we arrived in Beijing. 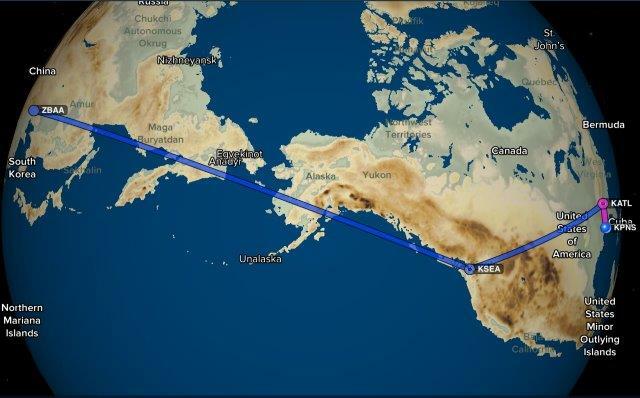 Flight 129 changed planes and continued as Delta 129, departing Seattle at 8:25 pm and arrived in Beijing on Friday at 11:25 pm after an 11 1/2 hour flight. As I boarded that flight, I attempted my first spoken Chinese to the attendant, saying, xièxiè, meaning, thank you, to which she responded, bù kèqì, meaning, you're welcome. So for an entirely Chinese interaction, it was so far, so good, and I was pleased with myself. 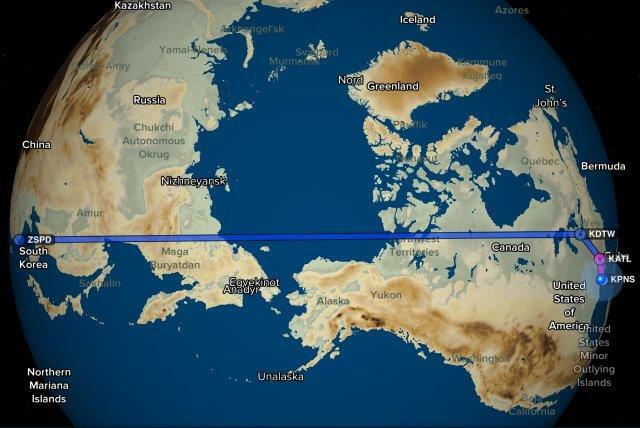 The flight itself followed the night and crossed the international date line. 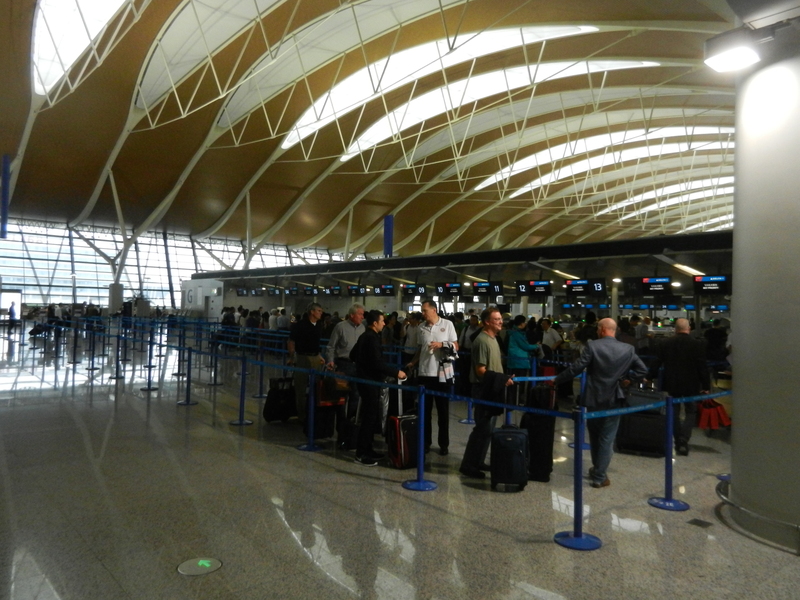 After arriving, we wove through numerous, seeming endless corridors, going through passport control, getting luggage, then customs. 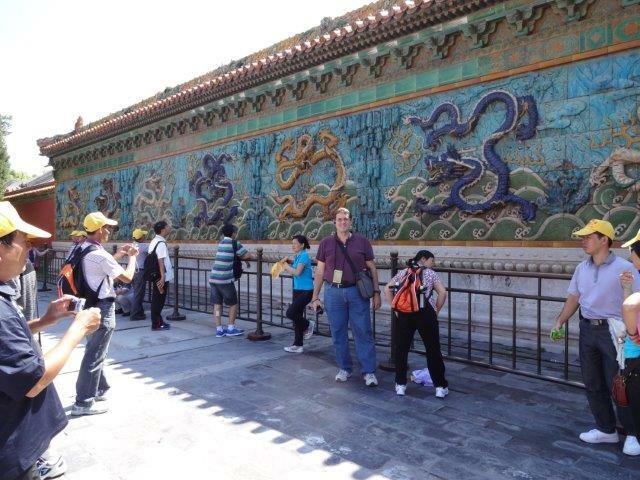 There was no conversation with the Chinese immigration staff. We then found ourselves in the taxi queue, there were only a few people there that late at night. 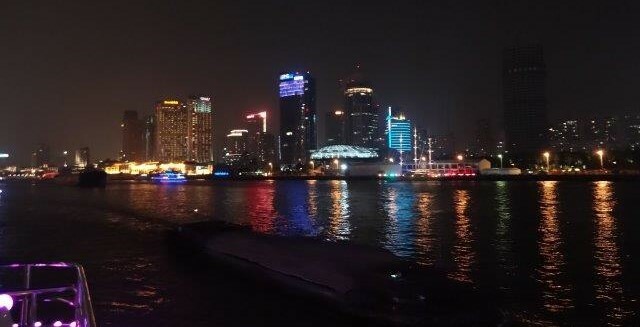 We said, nǐ hǎo, meaning, hello, to the taxi driver, but after that, the driver figured we did not speak Chinese and the driver did not speak English. 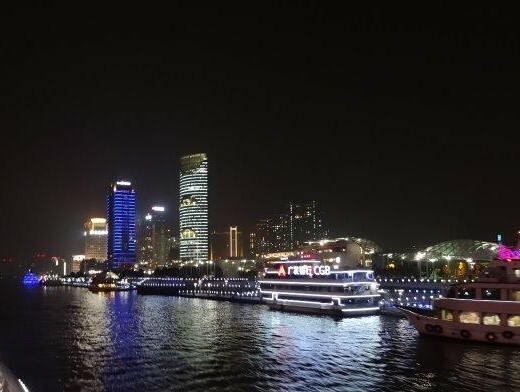 We were prepared with our "taxi card" with the name of our hotel, Park Plaza Beijing Wangfujing, along with the address, and the driver understood. 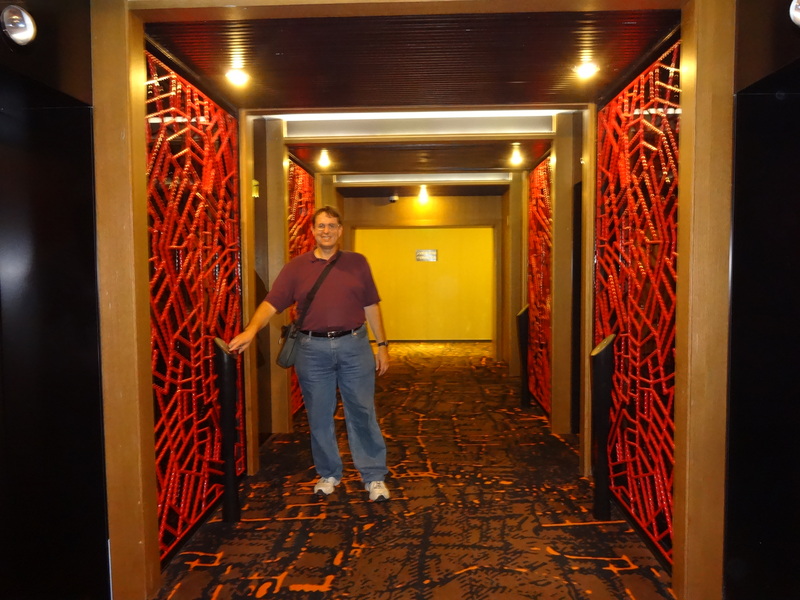 The hotel staff spoke English, and by 2:00 am, we were settled in for our first night in China. 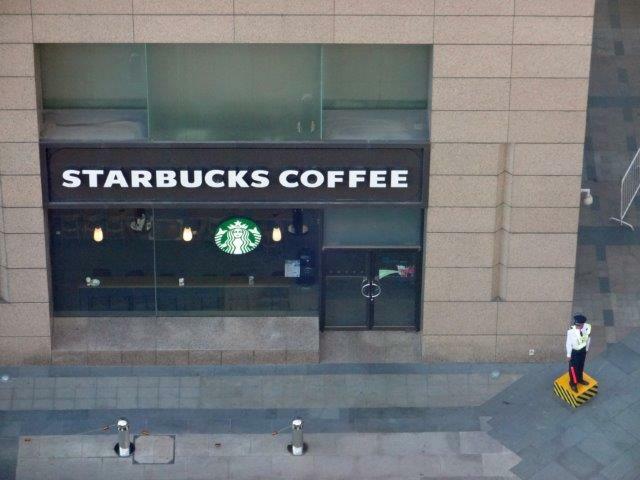 Waking up and looking out of the window, we noticed that there was a Starbucks next to the hotel. This was wonderful, since we wanted to eat a light breakfast and we really wanted American coffee. While waiting for Will to get there, we got coffee and a pastry. We walked around the hotel building, trying to get our bearings. I knew the subway station was nearby, but could not readily locate it. I asked what appear to be a police officer where was the subway, and he was unable to understand anything I said. My Chinese was not working at all! Will arrived, and after warm greetings, we set out to the Denkshikou subway station, which was hidden at the corner of a nearby building, just around the corner from where I asked the police officer. 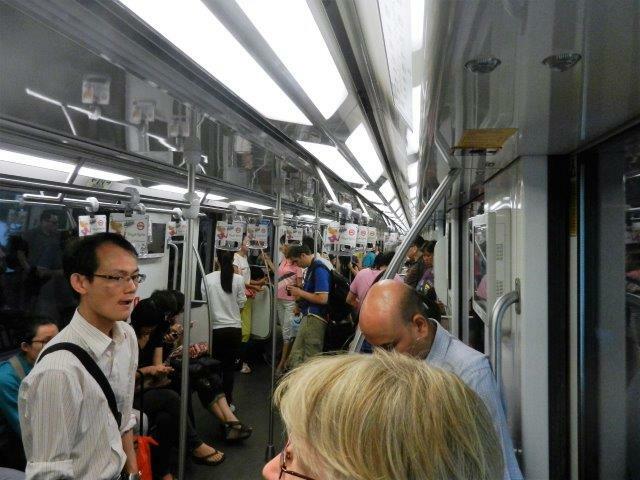 The subways were easy to use, with instructions in English as well as Chinese. 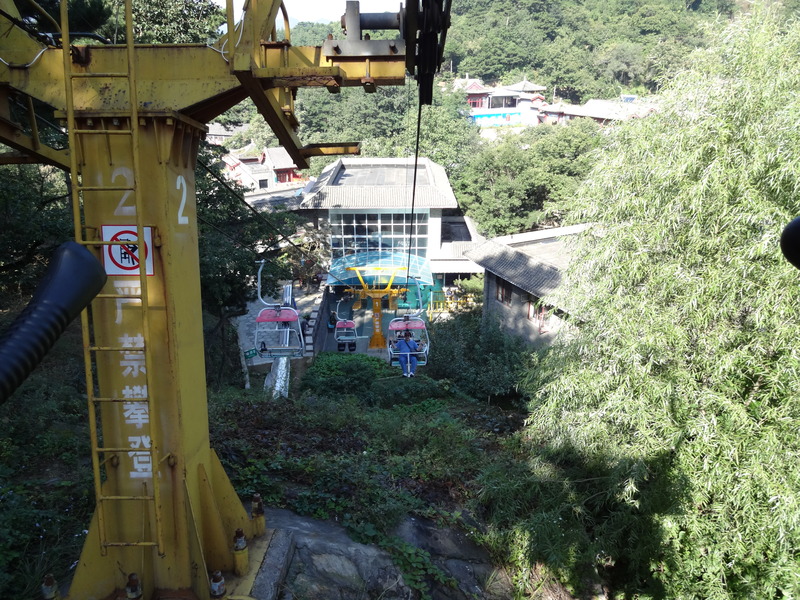 The fare was only ¥2, about 30¢, for a day pass. 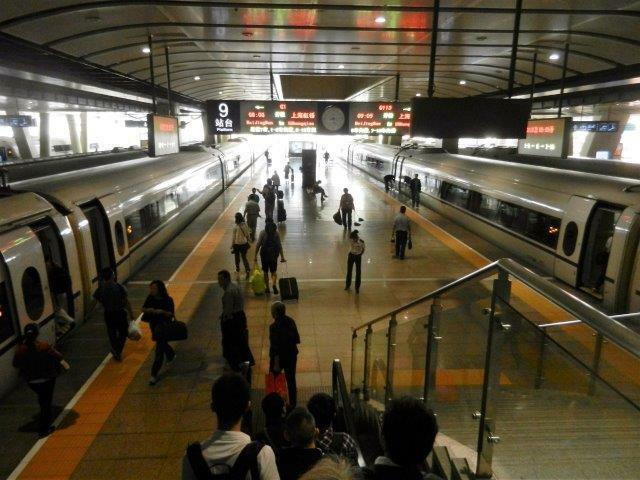 Subway line 5 took us to the Dongdan station, transfer to line 1 to take us to the Tiananmen East station. We climbed the stairs out of the station and saw that iconic pagoda building that is at the entrance of the Forbidden City, the place at the north end of Tiananmen Square that is often shows up on television. 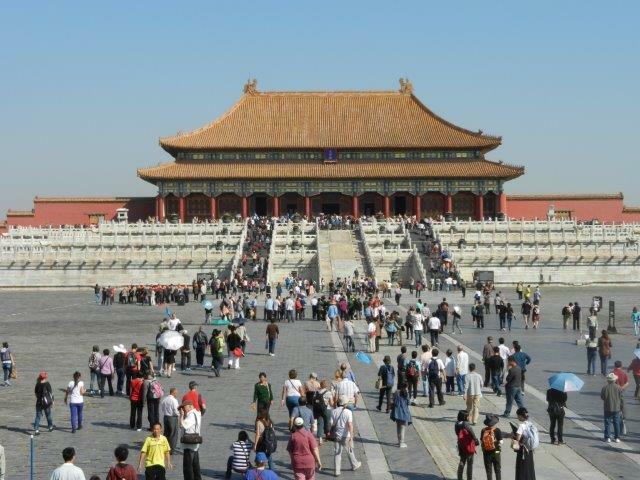 Leaving the Forbidden City for another day, we set out to explore Tiananmen Square. 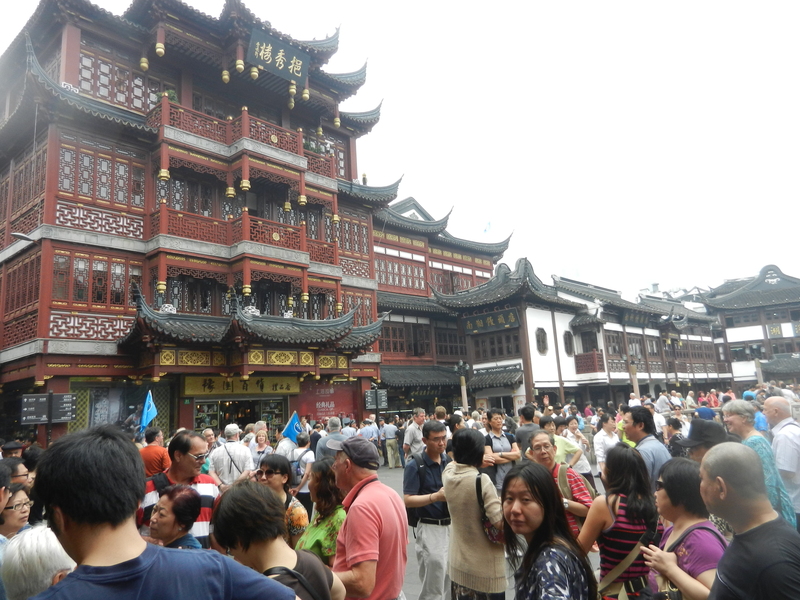 It was a big space, crowded with people. The area reminded me of Washington D.C. There were wide streets and government buildings, which were not very high. 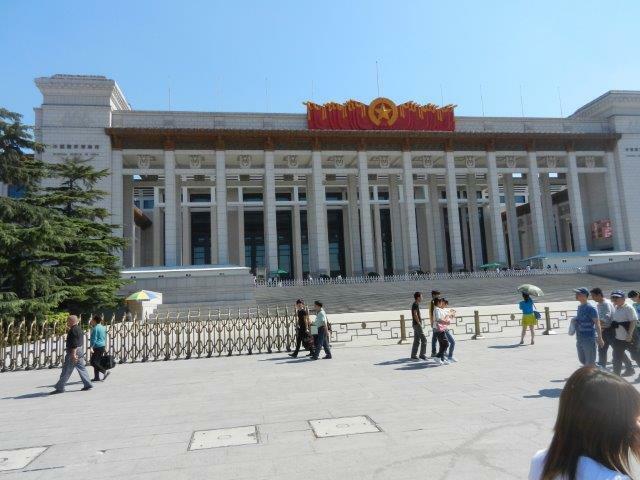 We walked by the Mausoleum of Mao Zedong and the Great Hall of the People. Some Korean students asked us what was our dream. They wanted our picture, but they were really after Will. Will explained that he was frequently asked by Chinese and other Asians for his photo, and it got to the point of annoyance so he has been turning them down. 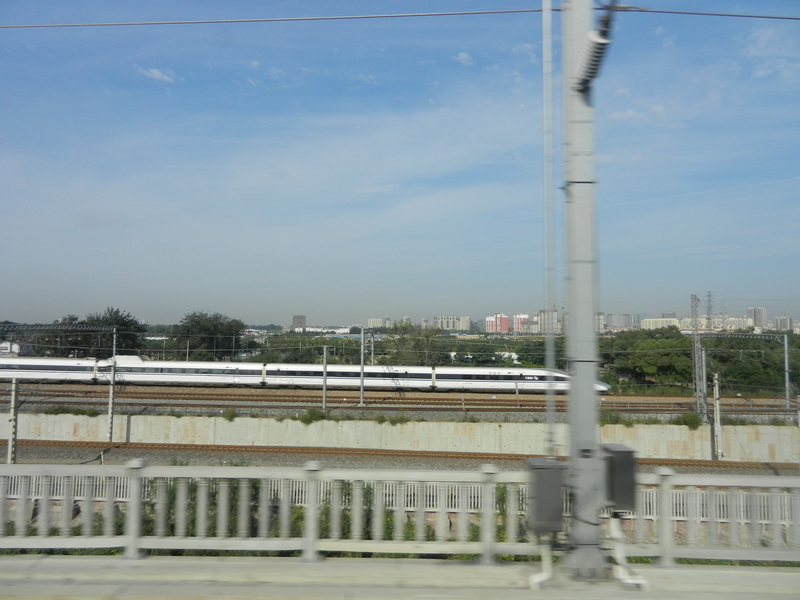 We took the subway line 1 and 5 to the Dongsi station, which was on Dongsi St, northwest of the Forbidden City. 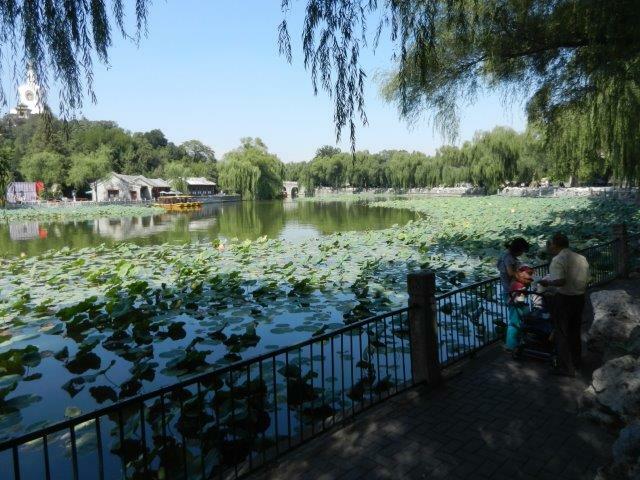 With no subway to go to Beihai Park, we first decided to walk. Will walked us 3 blocks until we realized it was the wrong direction with Google Maps. Will was able to flag a cab and talk to the driver. 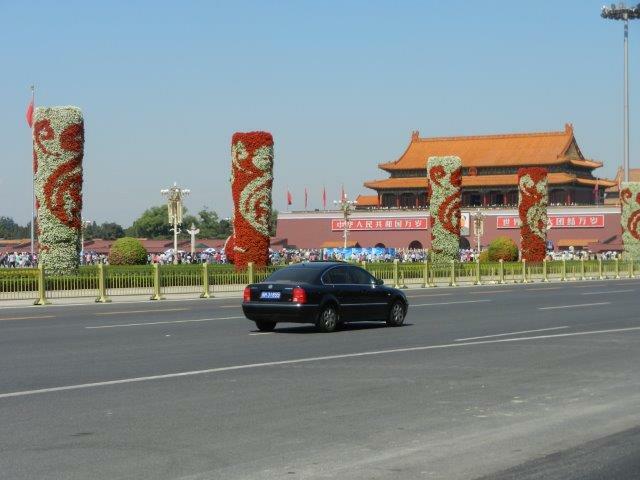 We drove down Wusi St, which became Jingshan St as it passed the north side of the Forbidden City. 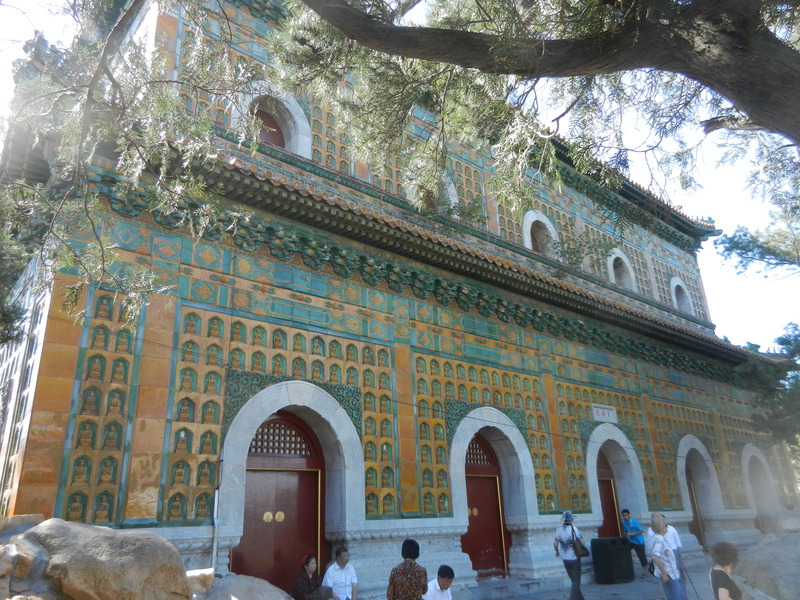 We stopped near the entrance of Beihai Park, and paid the fee to enter. 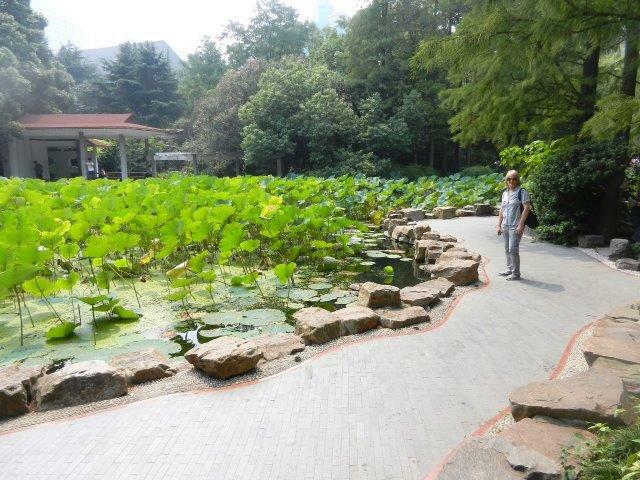 Inside, we walked around a lilly pad filled lake, then across a bridge to a stairs that took us up about 100 feet to the White Pagoda, a Buddhist temple When we stopped to sit and rest, a girl snuck up and snapped a photo with Will, before he had any chance to turn it down. We saw a white cat that looked a lot like Paka walking on the top of a wall. After walking down the steps, we found a nice little restaurant for lunch. While eating, Will helped us turn the little bit of travel Chinese we had remembered into something that would help us survive, especially how to order a meal at a restaurant where no one spoke English. We could easily order by pointing to a picture in the munu book and saying zhège, meaning this. During the two days when we saw the sites without Will until evening, we tried to speak what we knew, growing confident that we could get by. Any mispronunciation of a word in Chinese is a different word, so we used our Pieco app on our cell phones to show the Chinese characters when we sounded like Mandarin gibberish. After lunch, we walked west along Jingshan St to Jingshan Park, which is directly north of the Forbidden City. 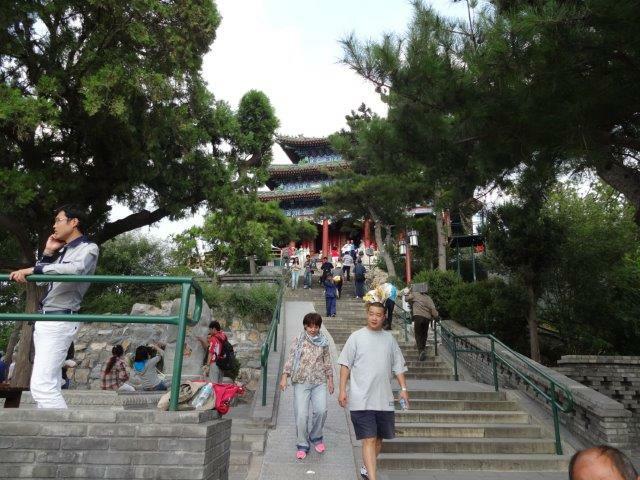 Here too, we found steps and walkways that took us up about 150 feet to the Wachun Pavilian, a Buddhist temple. 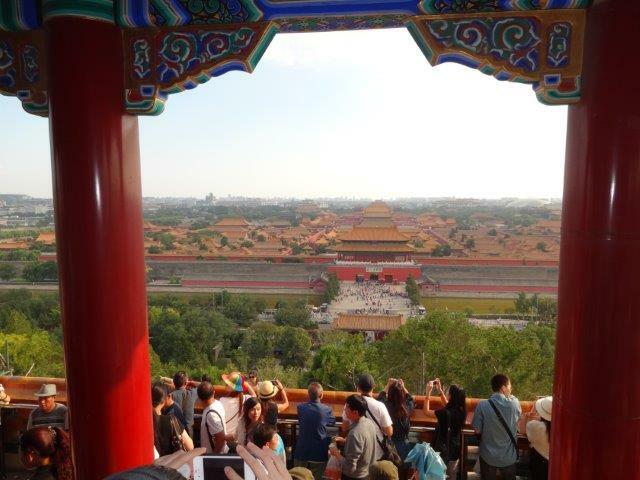 There were great views of the forbidden city and surrounding Beijing. 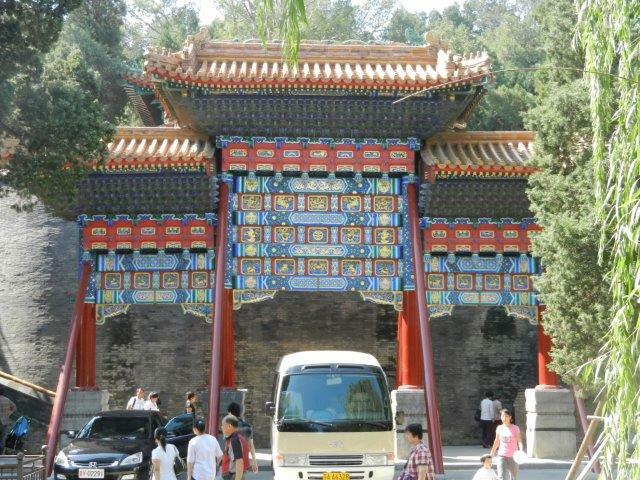 We then took a bus to that let us off at Wanjfuging and Dengshikou, within a block of the hotel. We walked back to the hotel and found a bakery on Dengshikow St, and we bought some Chinese pastries to eat with our Starbucks coffee in the morning. 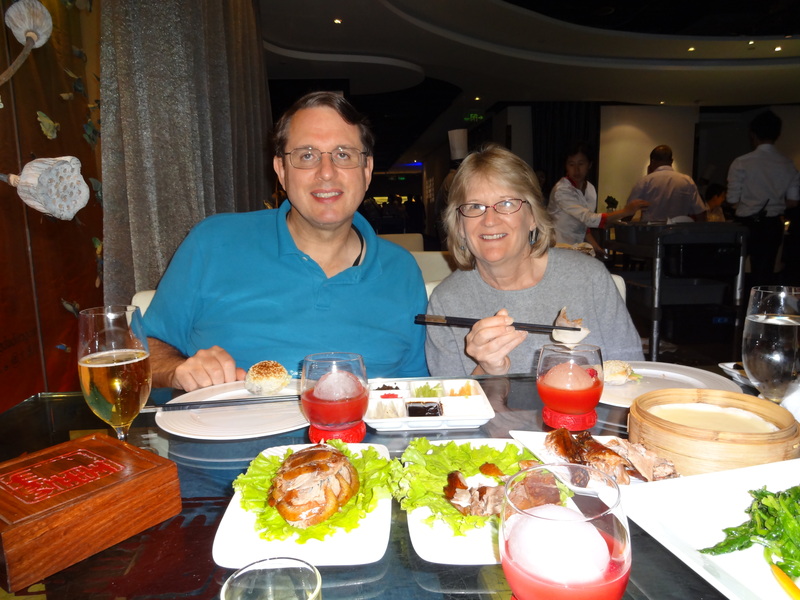 Being in a city that was previously called Peking, we wanted to eat the world famous, Peaking Duck. Liz found the Da Dong Roast Duck Restaurant in Trip Adviser, which was near our hotel. We were told it was awarded, "Best Chinese Restaurant of the Year." The meal was wonderfully delicious, a tasty end to our first day in China. 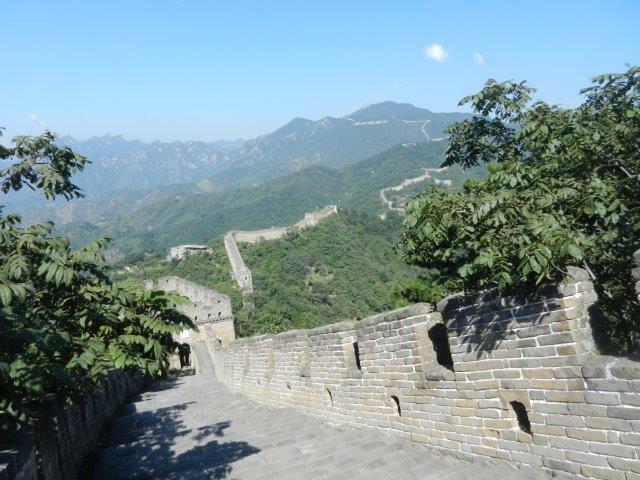 Months before our trip, Liz found out that the Great Wall at Mutianyu was a little further away from Beijing than other section restored sections fo the wall, and it was less crowded. It also featured a toboggan ride. 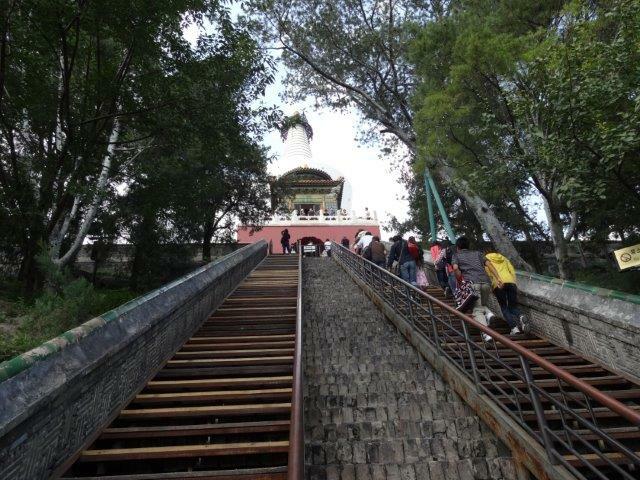 One look at the Mutianyu toboggan on You Tube and we knew we had to get there. From Trip Advisor, Liz was able to find a driver, John, who was also a real estate agent. We were able to contact him by email prior to our trip. For ¥600, about $90, he agreed to drive us from our hotel to the Mutianyu Great Wall, wait for us there, and drive us back to the hotel. 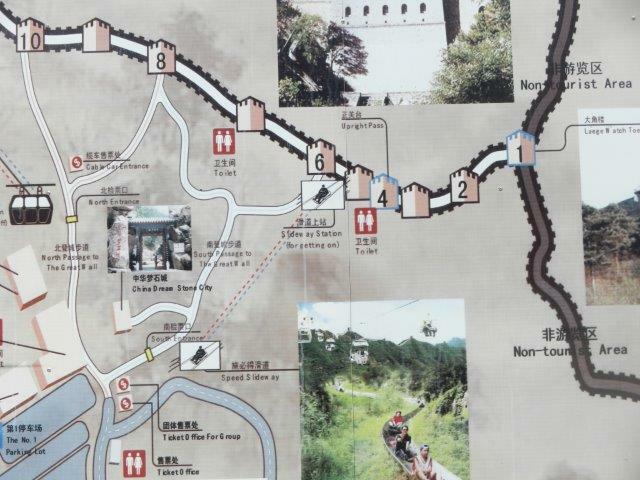 The drive to the Great Wall was at first over the G45 expressway, then over smaller road, to arrive at a rather crowed parking area. After parking, John led us on foot a short distance through a little area crowded with souvenir shops to a ticket booth where we bought tickets for the ski lift ride up to the Great Wall. We walked along the Great Wall, past what looked to be quarters for the soldiers, up a long set of stairs, through guard towers, and eventually to the end of the restored section of the Wall. Will climbed up high on the guard tower. 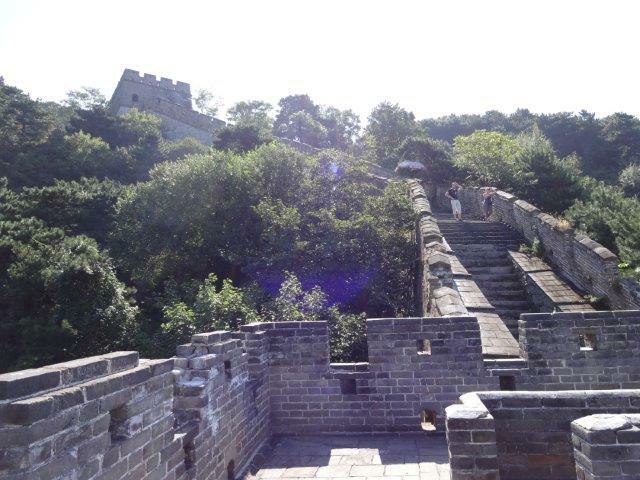 Before leaving, we were able to find a public restroom near the Wall. Most of the facilities tuned out to be squat toilets, amounting to a porcelain slit and hole in the floor. Liz found that the handicap stalls had conventional toilets, so she considered herself handicapped with the squat toilets. The entrance where he got off the ski lift was also the exit to the toboggan ride. 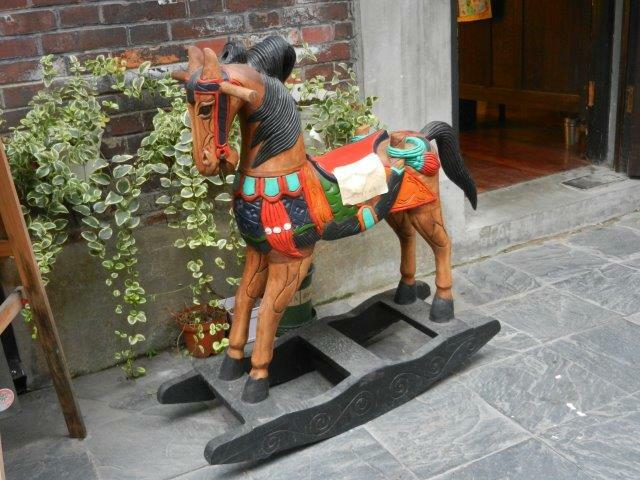 The toboggan itself was a flat seat with 4 small wheels and a stick between the legs to act as a brake. 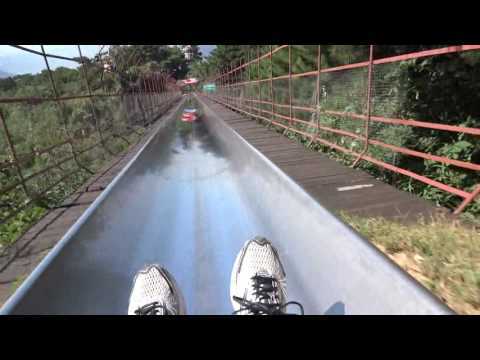 There were instructions to maintain a moderate speed, keep at least 35 meters (80 feet) from the toboggan in front, and do not stop during the decent. Another part of the sign was entitled, "Tobogganing is so simple," and show a picture to push the stick forward to go faster and back to break. The track had sides to keep the toboggan inside, and steeper banks for turns. 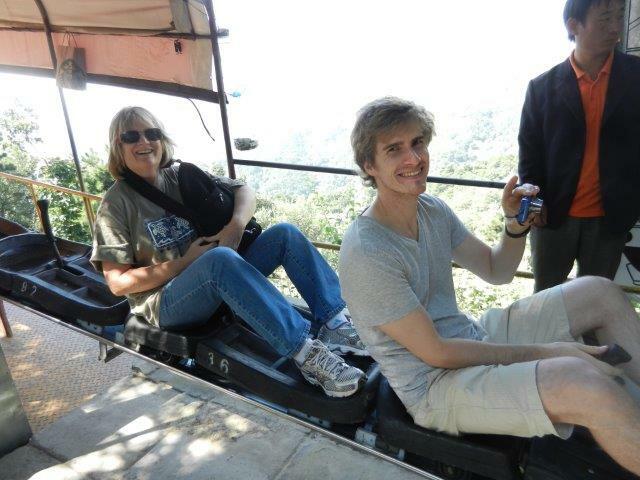 Liz and I took kept up a moderate speed, but Will was more adventurous and tried to see how fast he could go. The toboggan ride lasted a long 4 1/2 minutes. On the way back, Liz and Will fell asleep in the back seat of John's car. 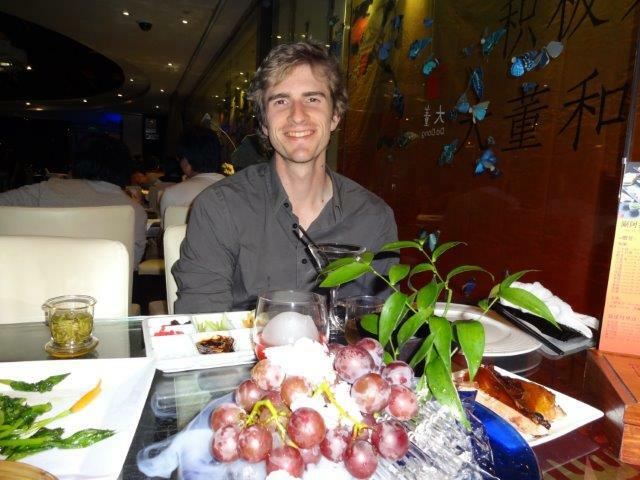 I asked John questions about his life and the Chinese culture. He was 29 years old. He dated, but didn't find anyone we wanted for a wife. He said that girls want guys to have a nice car and apartment. Parents tell their children what to do until they have their own children, then they stop. In a family, if first child is a boy, they can have only one child. If first child is a girl, they can have another child. He said that an election for chairman was soon, but everyone knew who the next four chairman would be. People elect their representatives, and the representatives elect the chairman. Taxes are 20% of income, but he did not know how the government spent the tax money. He would have to work 50 years to get full retirement benefits, but can get partial benefits with fewer years worked. Has to pay for his health insurance, which pays 80% of medical expenses. Lucky numbers in China are 3, 8, 9. Unlucky is 4. John dropped us off ot Tsingha University. We walked to the international dormitory building where Will was staying, and saw Will's tiny apartments. 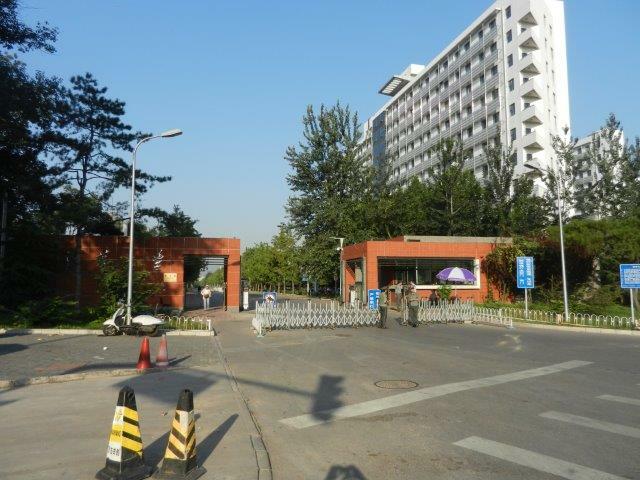 We also looked around a bit in the international dormitory. 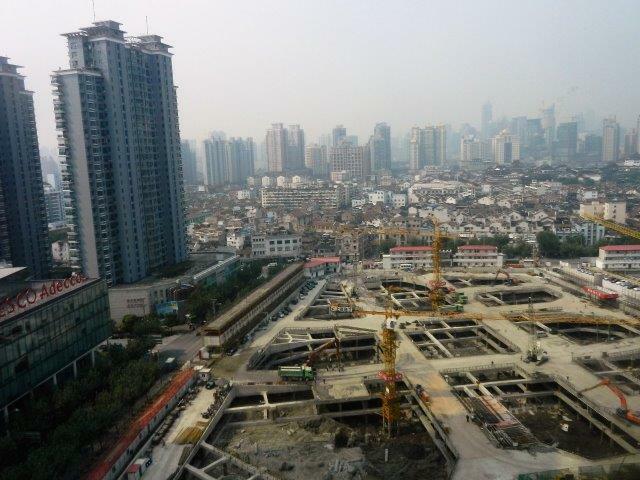 We took the bus back to the subway station, the subway to line 10 to the Tuanjiehu Station. It was a short walk for a couple of blocks to Sanlitun. 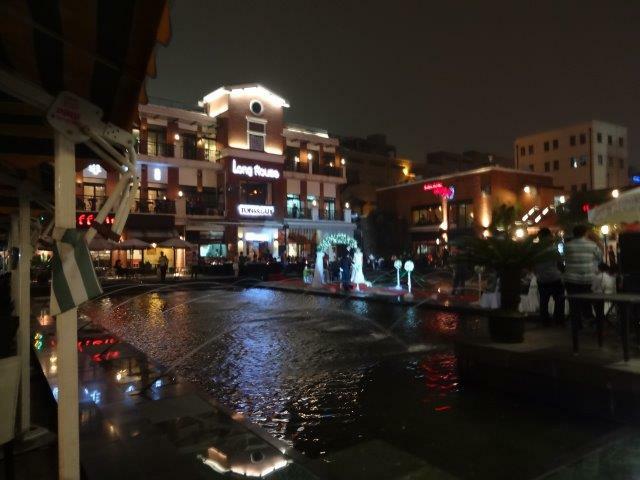 There were some tall multicolored buildings and a shopping mall with a programmed fountain in the ground. We walked around the Yashow Clothing Market. 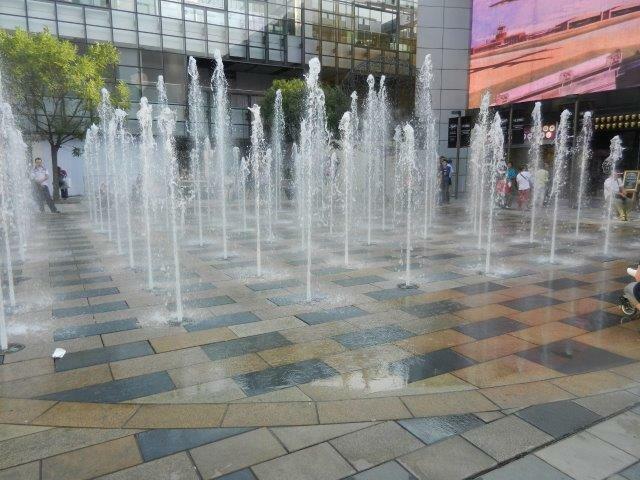 We watched a fountain in the ground that was programmed to produce patterns. We found a Noodle Bar for dinner. After taking the subway back to the hotel, we walked around the corner to the bakery on Dengshikow Street and purchased more pastries for the morning. Before leaving the hotel, we ate Chinese pastries and drank Starbucks coffee. Tourist information had advised to get there early because tickets inside were limited. 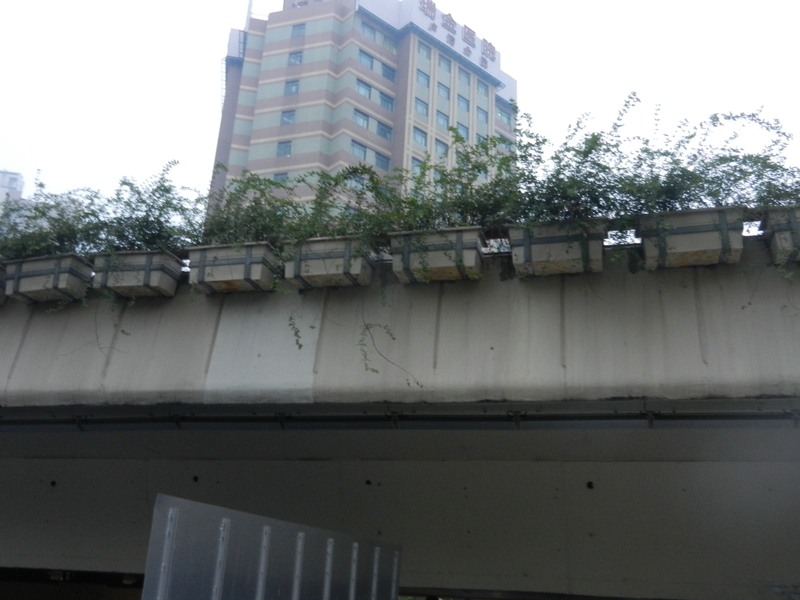 We took the two subways back to the Tiananmen East station. 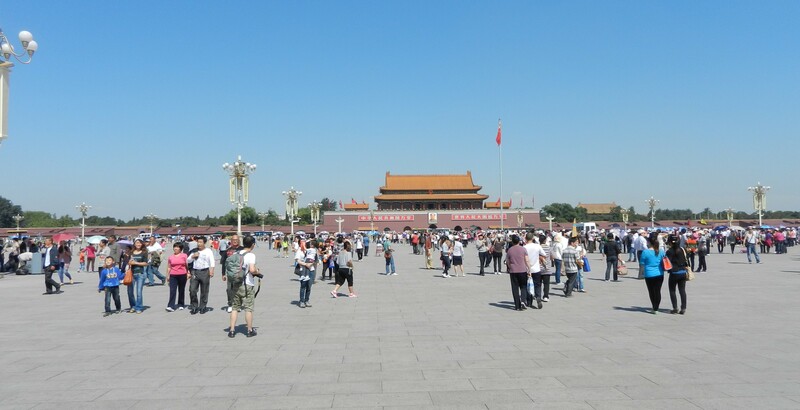 After exiting the station, we walked under the large picture of Chairman Mao, under the famous Tiananmen Gate building, and up the path and under the Daunman Gate to the ticket booth by the actual entrance to the Forbidden City. 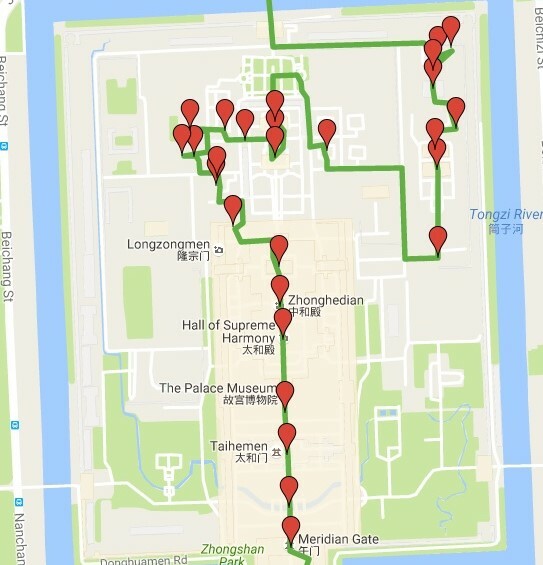 We walked thought the Forbidden City for about 3 hours. (Click the map or here to see our path with photos). We saw: (1.) the Meridian Gate, (2.) five bridges over the Inner Golden River, (3.) the Gate of Supreme Harmony, (4.) Outer Court, (5.) 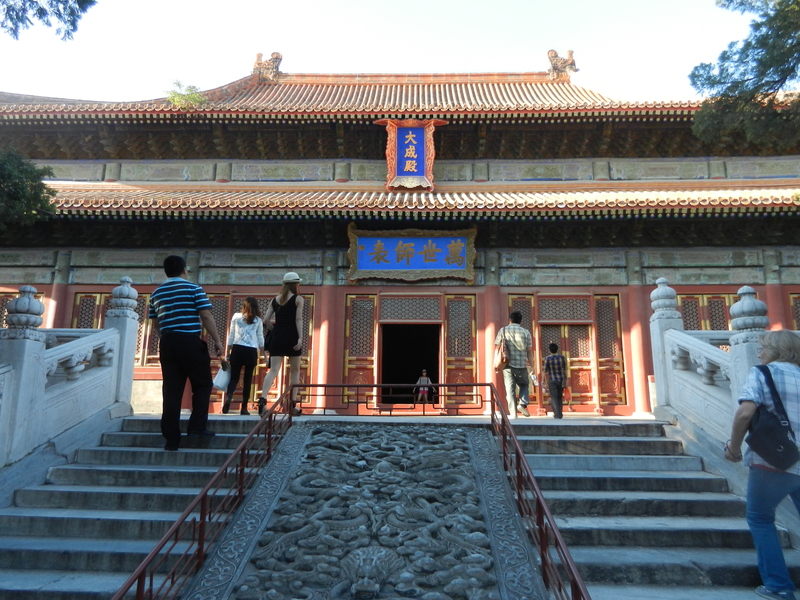 the Hall of Supreme Harmony, (6.) 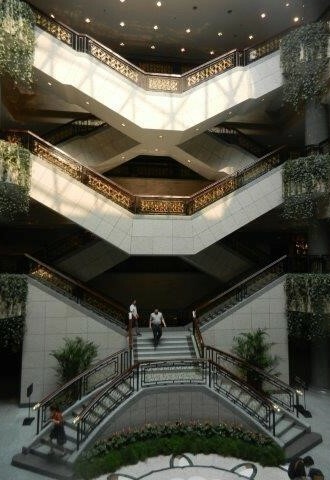 the Hall of Central Harmony, (7.) 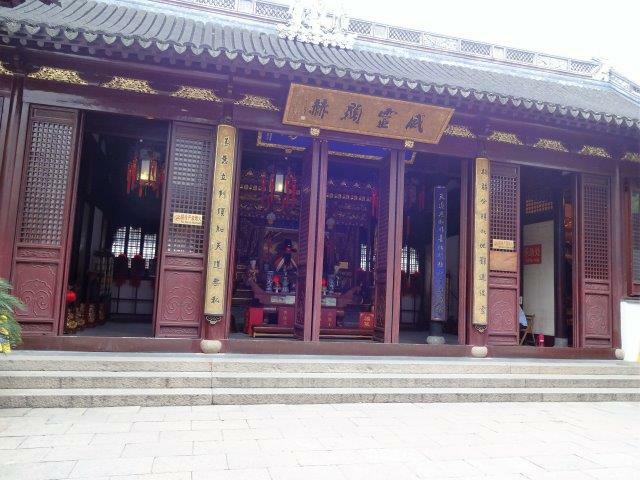 the Hall of Preserved Harmony, (8:) the Grand Council of State, (9:) the Hall of Mental Cultivation, (10.) the Hall of Consolation, (11.) the Hall of Great Supremacy, (12.) the Hall of State Unity, (13.) the Palace of Eternal Spring, (14.) the Hall of Manifest Harmony, (15.) the Hall of Union and Peace, (16.) 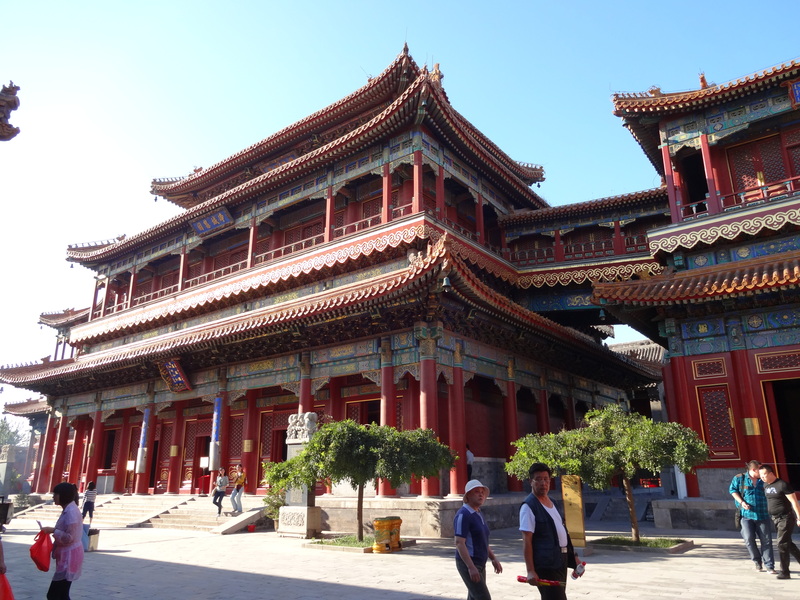 the Palace of Heavenly Purity, (17.) 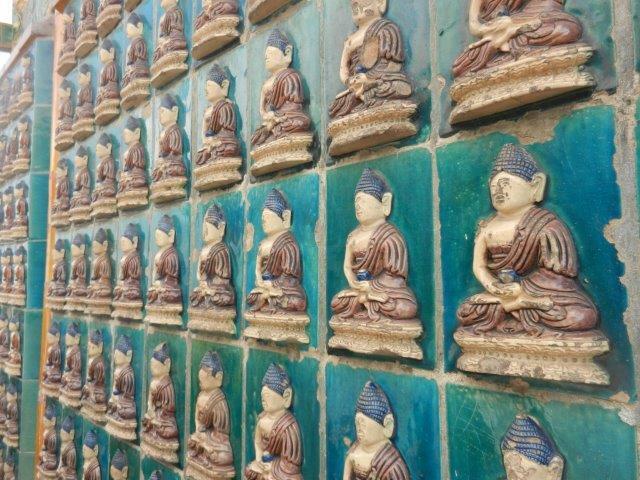 the Hall of Earthly Tranquility, (18.) the Hall of Benevolence, (19.) the Nine Dragon Screen Wall, (20.) a museum, (21.) the Palace of Peace and Longevity, (22.) the Pavillion of Cheerful Melodies, (23.) the Hall of Joyful Longevity, (24.) the Hall of Harmony (25.) 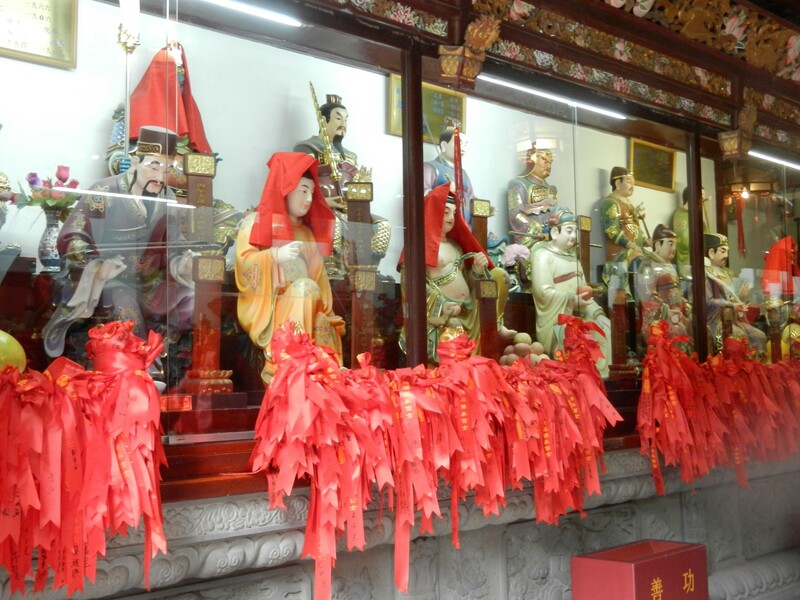 the Morning Chamber in Memory of Concubine Zhen, and (26.) 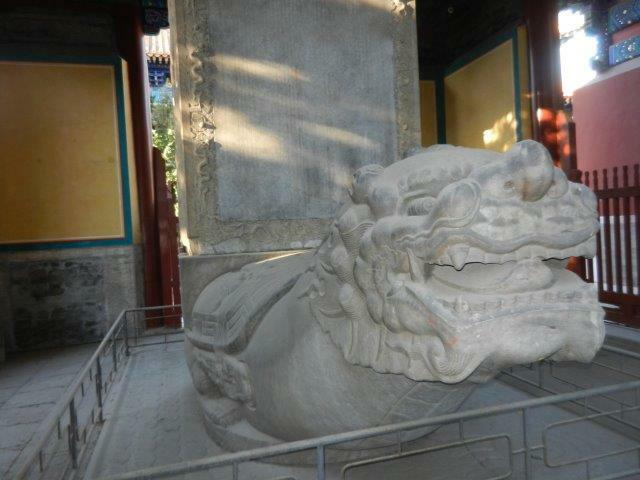 the Well of Concubine Zhen. We left the Forbidden City at the north gate, across from the entrance of Jingshan Park. We decided to walk along Wusi Street, looking for places to eat lunch. There were restaurants, but nothing seemed to be appropriate for a light lunch. 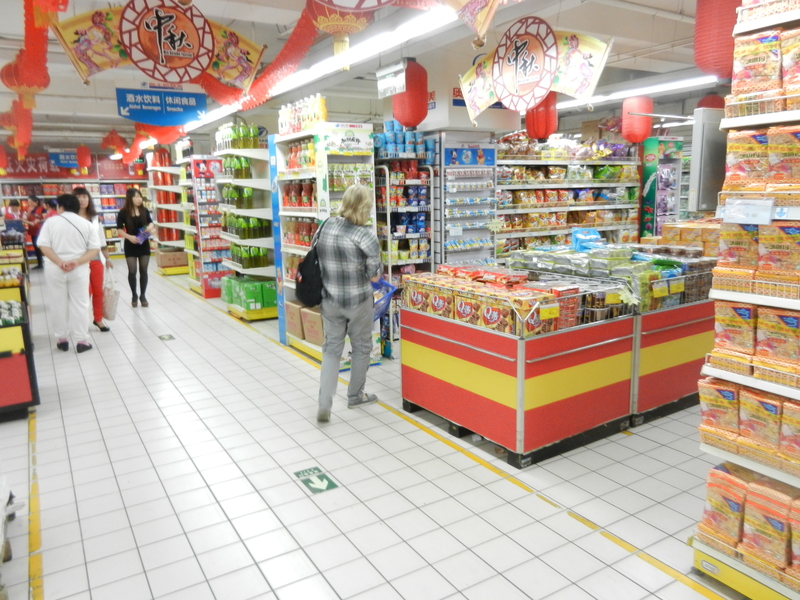 We arrived at the Dongsi Street subway station, and found We Mart, a 3 story supermarket. At Wu Mart, we bought bottled water, mango juice, green tea, and pastries for lunch. 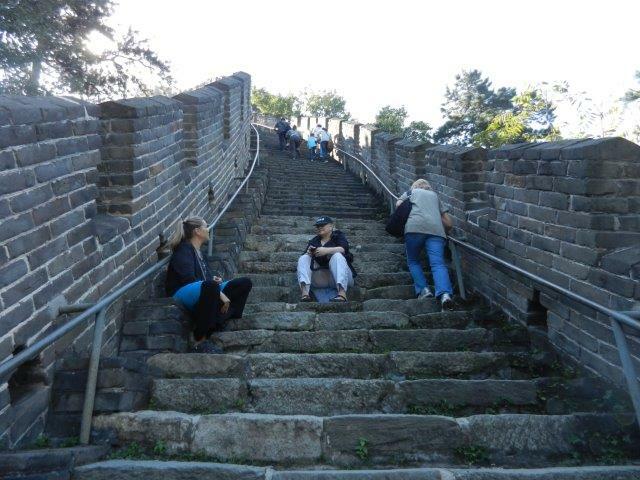 We understood from Will that it was totally unsafe to drink tap water in China, so we always carried bottled water in our backpacks. Pure mango juice was awesome. 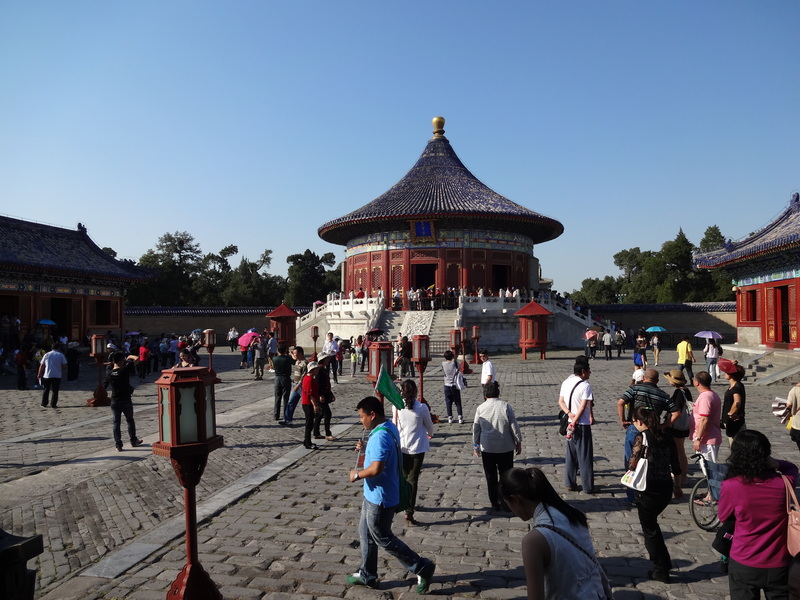 We then set out for the Temple of Heaven. Back on the subway line 5, we rode to the Tiantan East Gate station. 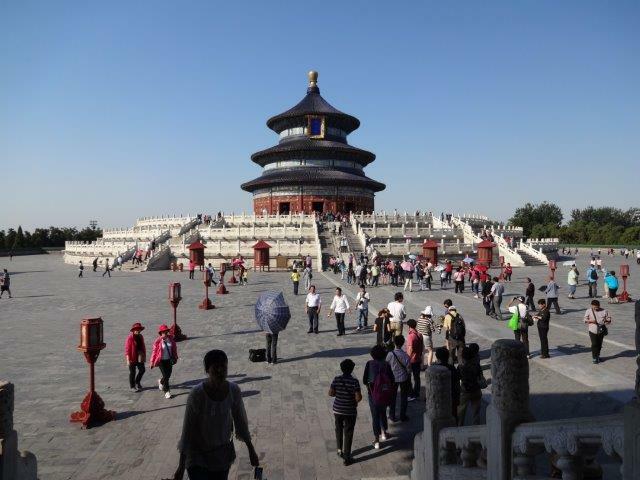 From there, it was a very short walk to the Temple of Heaven. 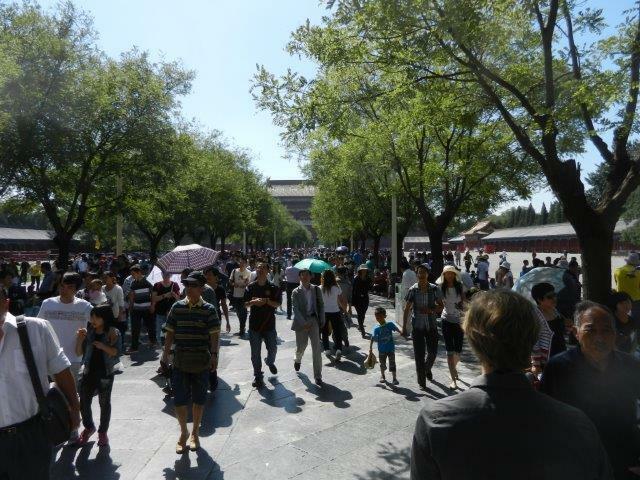 We walked thought the Temple of Heaven for about 2 hours. (Click the map or here to see our path with photos). 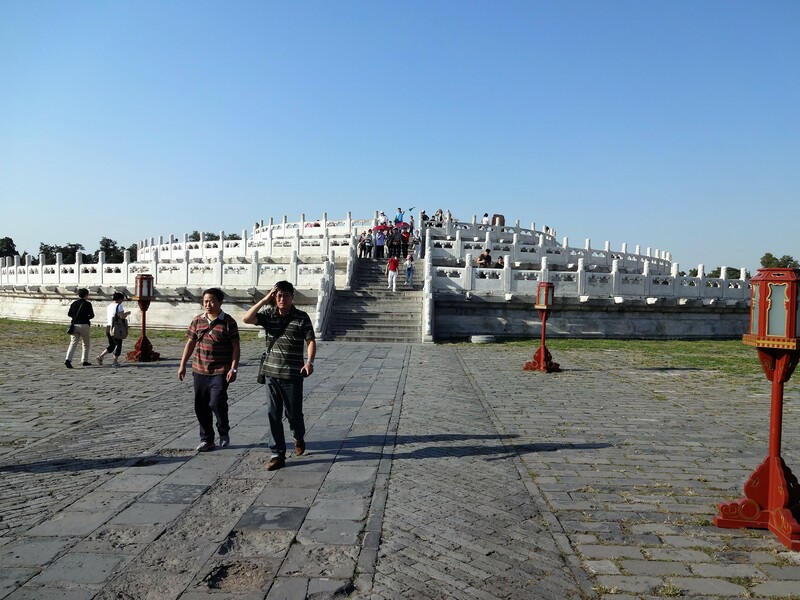 While at the Temple of Heaven, we saw (1) the 72 Long Corridor, (2) the Hall of Prayer for Good Harvest, (3) the Imperial Vault of Heaven, and (4) the Circular Mound Alter. After the Temple of Heaven, we took the subways that Will told us to take, and met him at a Tiwanese Restaurant for dinner. We were given menus that actually were books, with full color photos of the dishes and descriptions in Chinese characters but also some English. We had a hard time identifying what we wanted to eas, so Will ordered some highly spicy hot foods for us. We could barely eat them, and could not finish them. We rode the subways back home. By this time, we were becoming very proficient at finding our way in the subway system. We found it faster to go to the ticket counter and say èr, meaning two, while holding 2 fingers up. We then paid a ¥2 coin, about 30¢, for each ticket. 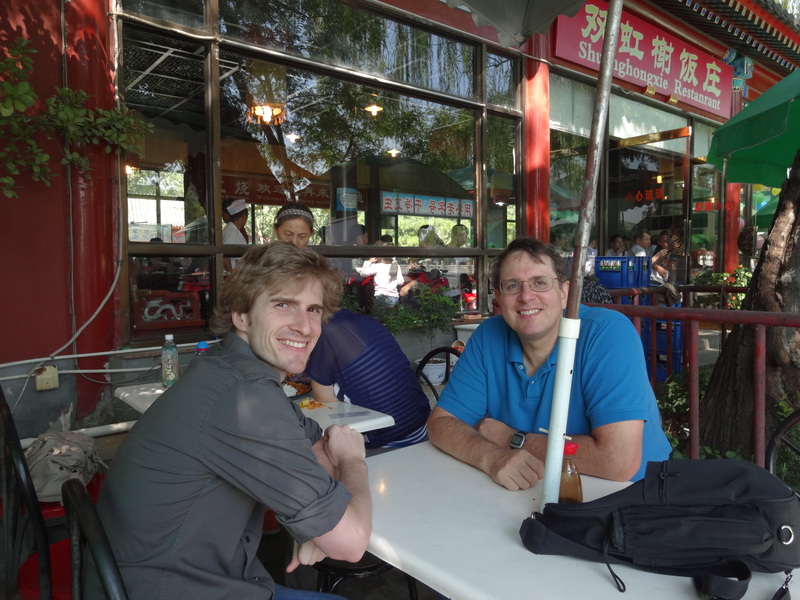 After the subway, we found a Chinese bakery and bought pastries for the next morning before returning to our hotel. Another morning with Chinese pastries and Starbucks coffee, then onto subway line 5, then line 10, then line 4 to the Beigongmen station. After exiting the subway, there is always confusion about which direction is north. 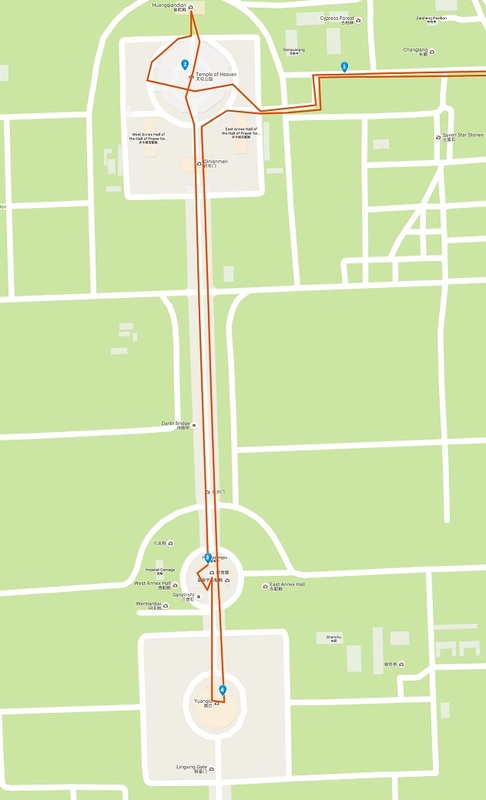 While watching Google Maps on the Android phone, we walked about 50 feet the wrong way, then seeing this on the Android, walked the opposite direction until we saw signs for the entrance of the Summer Palace. 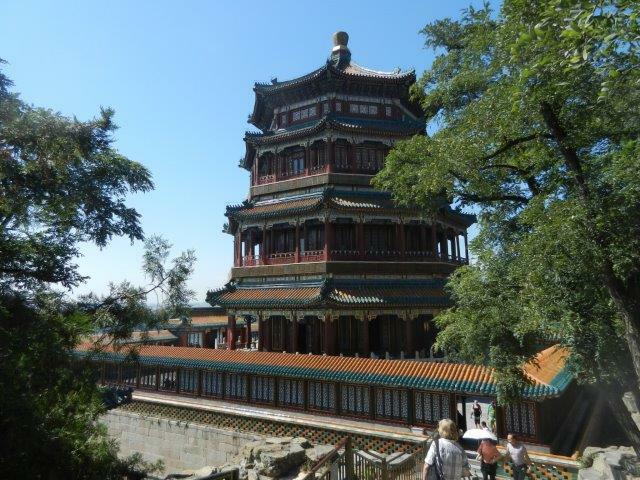 We walked thought the Summer Palace for about 3 hours. (Click the map or here to see our path with photos). 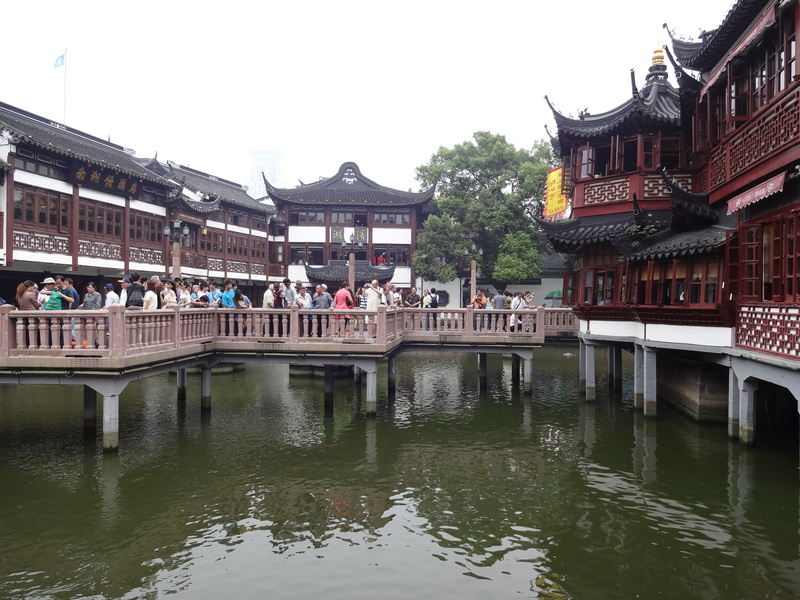 We saw (1) the Northern Gate, (2) Suzhou Street, (3) the Hall of Buddha Confirming His Doctrine, (4) the Temple of Sea of Wisdom, (5) the Tower of Buddhist Incense, (6) the Hall of Dispelling Clouds, (7) the Long Corridor, (8) the Gallery of Literary Prosperity, (9) the Hall of Benevolence and Longetivity, and (10) Danning Hall. 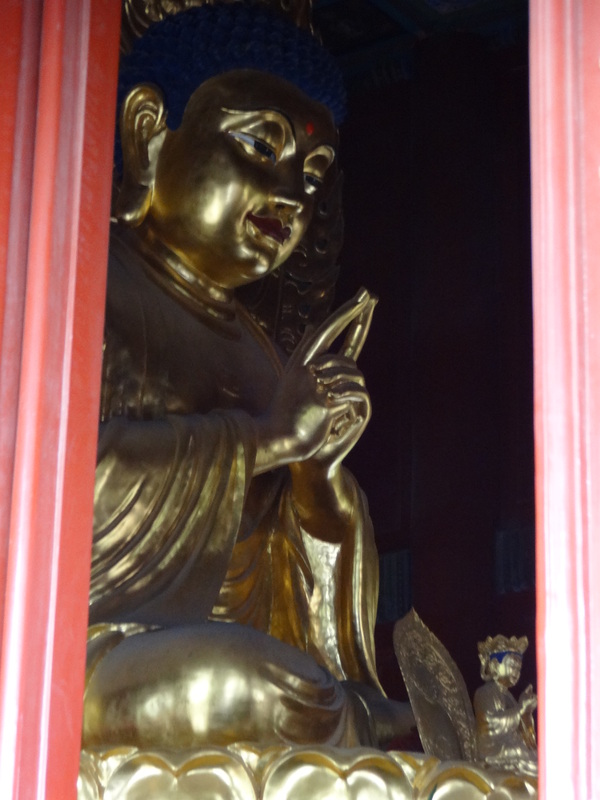 We got back on subway line 4, then line 2, then off at the Younghegong Lama Temple station. We exited the station at a busy intersection with the elevated subway line on Andingmen East St and Younghegong Street. 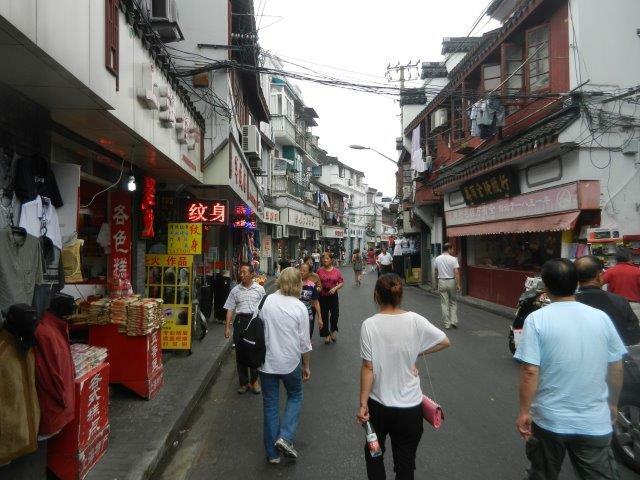 We walked south on Younghegong St. until we found a restaurant. It was a small restaurant, there was only one table with diner, but we decided to give it a chance. After we were seated at a tale, the waitress gave use each bound book menu with colorful photos of dishes with Chinese and English descriptions. We were careful with what we selected, and looked for dishes that we could identify. We got Kung Pao Chicken and a lo main dish. Chinese food was really tasty. At the restaurants we chose, the vegetables were fresh and the sauces were flavorful. We were not automatically given rice, so we had to ask for mǐfàn, meaning cooked rice, and were given a bowl of rice. 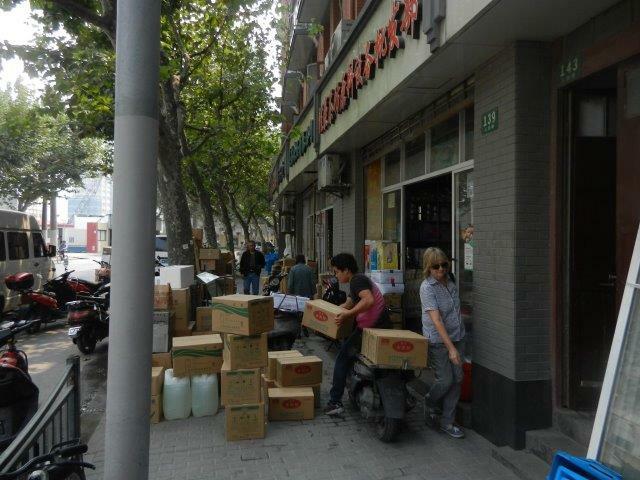 Trying to save money, we asked for báishuǐ, meaning a class of water, instead of bottled water. The waitress gave us a puzzled look, and brought over a small pitcher of hot water. This was probably tap water that was boiled. We then asked for píngzhuāng shuǐ, meaning bottled water, and drank that with our meal. 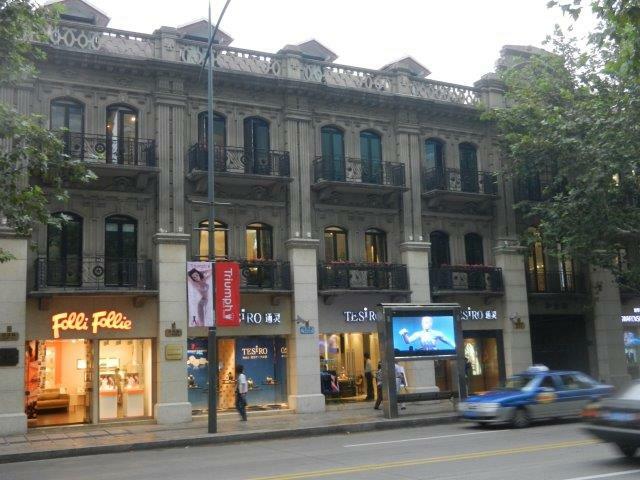 A quick walk further south of Younghegong Street was the Younge Lamastery. There were several colorful buildings with statues of Buddha inside, but watchful people prevented the taking of any photographs. 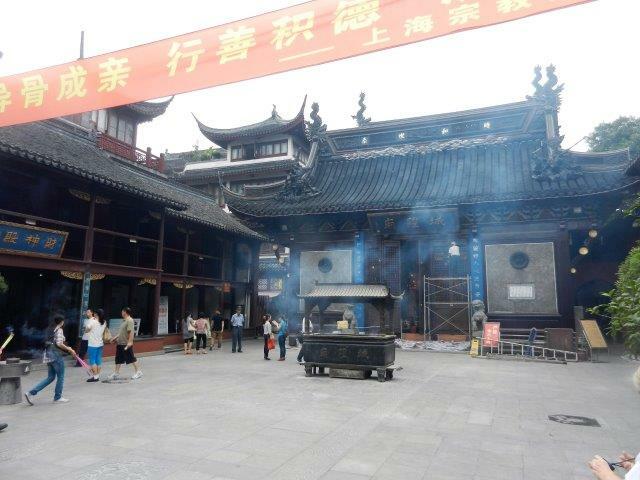 There were many involved in prayer, several waving sticks of incense. 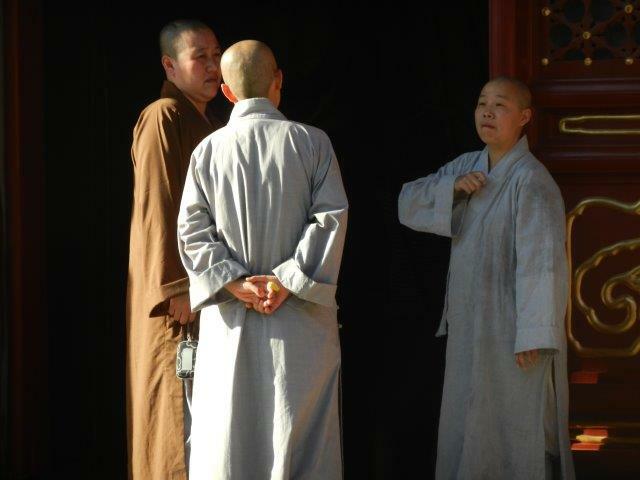 We saw monks, including a teenage monk being instructed. It was a very reverent place. 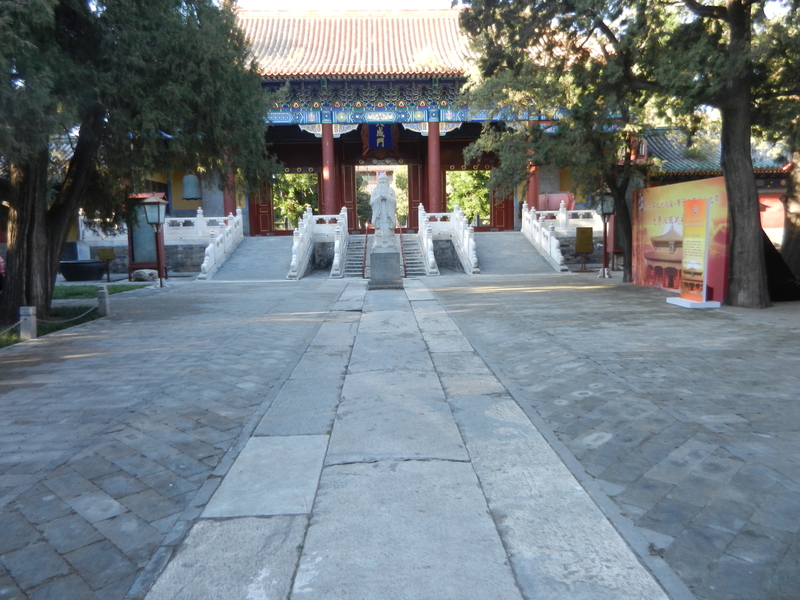 A walk down a tree lined Gouzijian Street led to the Temple of Confucius. This was a sterile place compared to the Lama Temple. 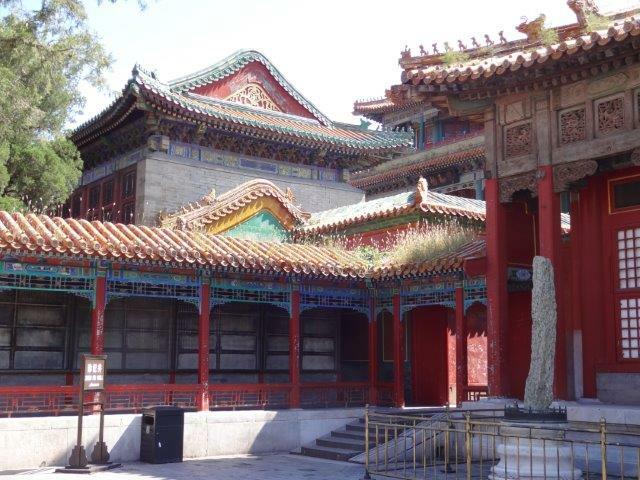 There were a number of small buildings each containing stone tables with Chinese characters, likely the writings of Confucius. himself. 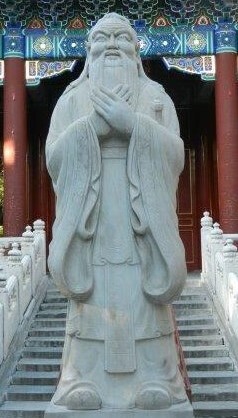 There was a large stone statue of Confucius. 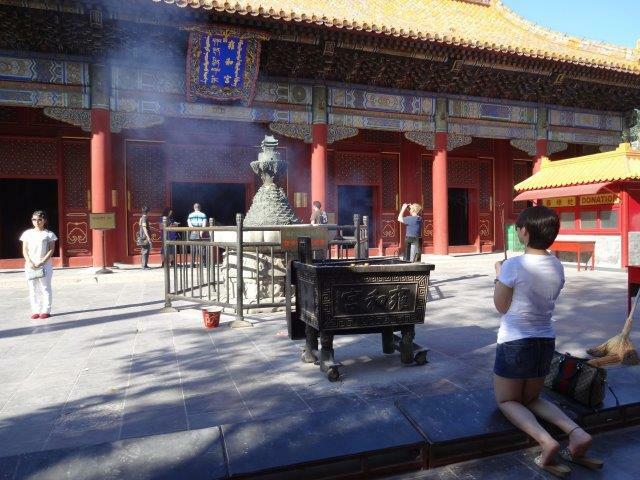 It was a place of contemplation instead of worship. 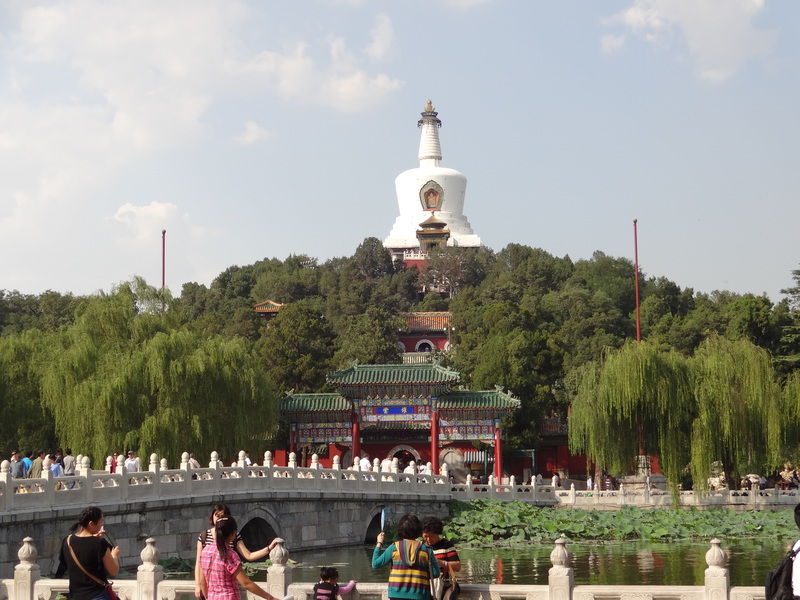 We walked back to the Younghegong Lama Temple subway station and got on line 5 to the next stop, which was Beixingiao station. 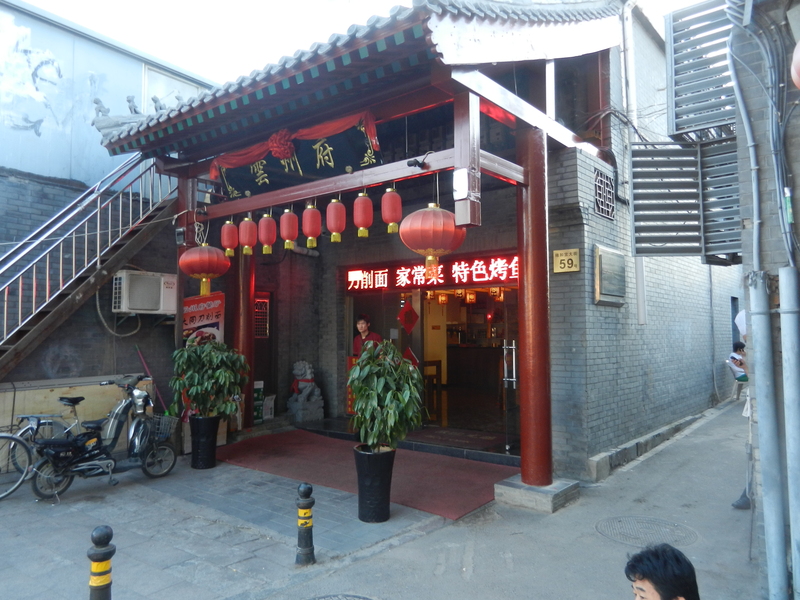 After exiting, we looked for The Hutong cooking school, walking though Shique Hutong and around the corner until we found their distinctive red door. 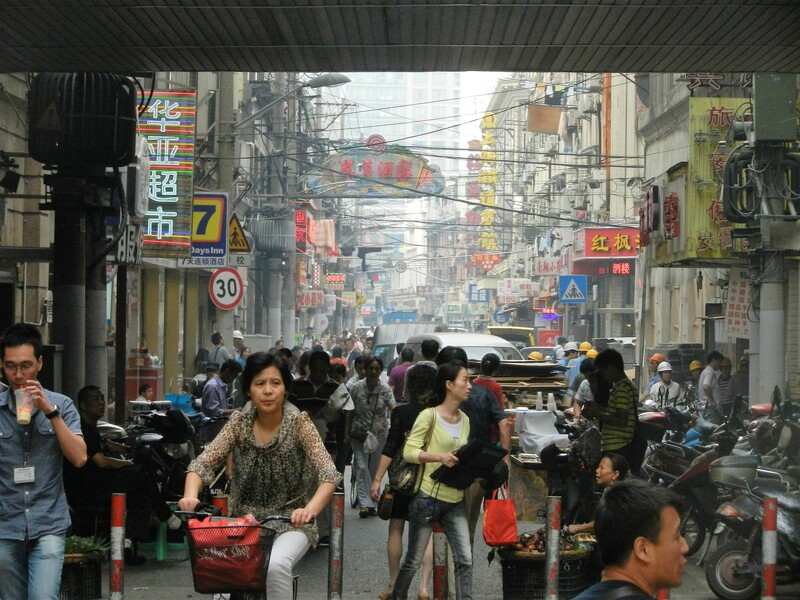 A hutong is an alleyway. We were early, so we went back to Donghimen Inner Street in the hopes of finding another bakery. This was a wide street, decorated by paper lights on both sidewalks. We walked east, passing many restaurants, but did not find a bakery. 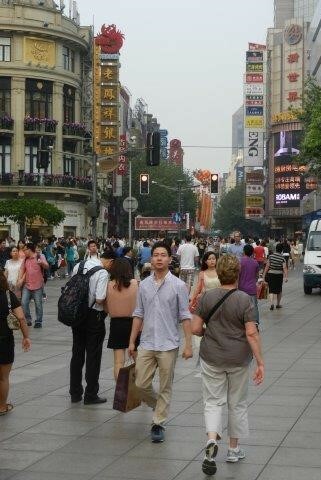 We crossed the street, and decided to ask an unsuspecting Chinese man standing by himself for directions. First I tried saying, zài nǎ'er miànbāo diàn, meaning, where is a bakery. 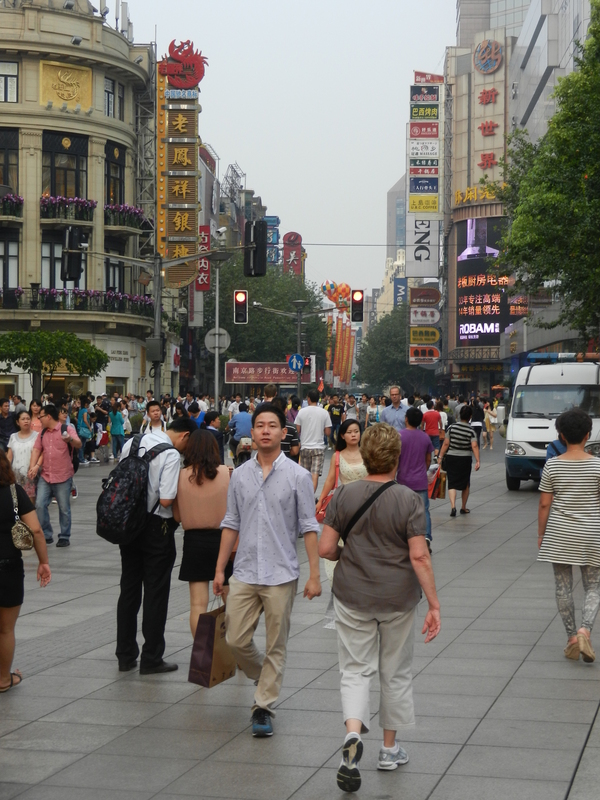 Zài nǎ'er is the Beijing dialect for asking where is something. No one ever understood me when I asked with zài nǎlǐ, which is standard Mandarin. The man responded with a very puzzled facial expression. and tried to repeat what I was saying. I realized that my pronunciation of Chinese was not correct, so I showed him the word using Peaco app on my cell phone, 面包店. The man said the word, and began to give us directions in rapid Mandarin, 继续在这条街上, 直到你看到在你右手边的面包店. We could not make out what he was saying, but fortunately for us, Chinese people often gesture with their hands when they spoke. 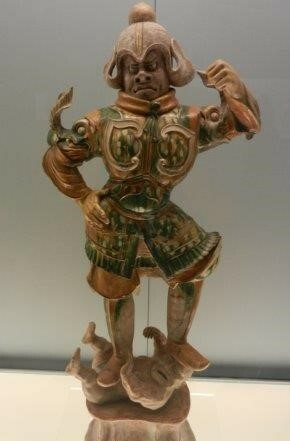 The man pointed us in the right direction, and we said xièxiè, meaning thank you. 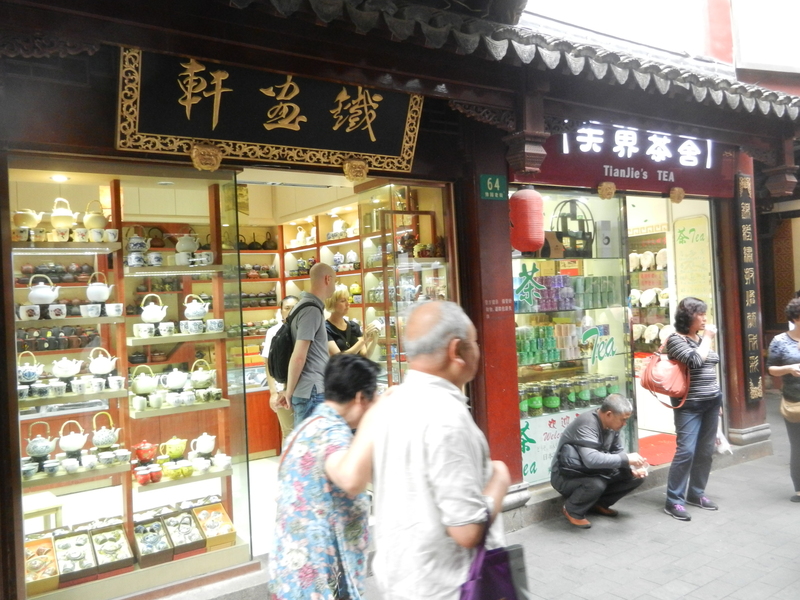 A short walk later, we found another unsuspecting Chinese man who we said zài nǎ'er while showing 面包店 on the cell phone. The man spoke in rapid Mandarin, 走在同一个方向，并在建筑物的最后右转，你会看到面包店, while gesturing in the direction we were waking and then into the block. These gesturers were helpful, and we found our bakery in the shops behind the KFC. 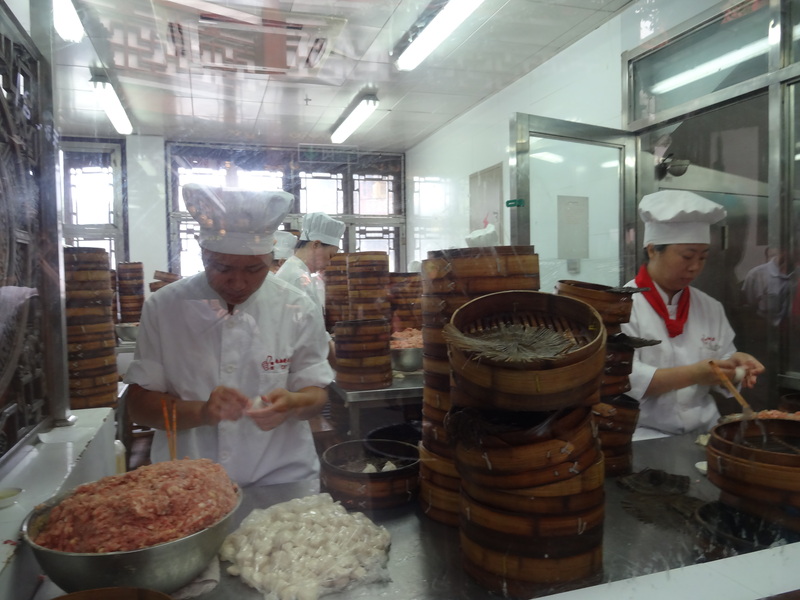 After buying our pastries for morning breakfast, we walked up the hutong again to The Hutong cooking school. Along with Liz, Will, and myself, there were two couples making 7 total students. Our instructor taught us to make dry fried green beans, sweet and sour shredded potatoes, and sichuan style boiled beef using la jiao (chili pepper) and hua jiao (sichuan pepper). We had the choice of making them spicy or mild. The spicy was way too hot of me, and mild is spicy enough. 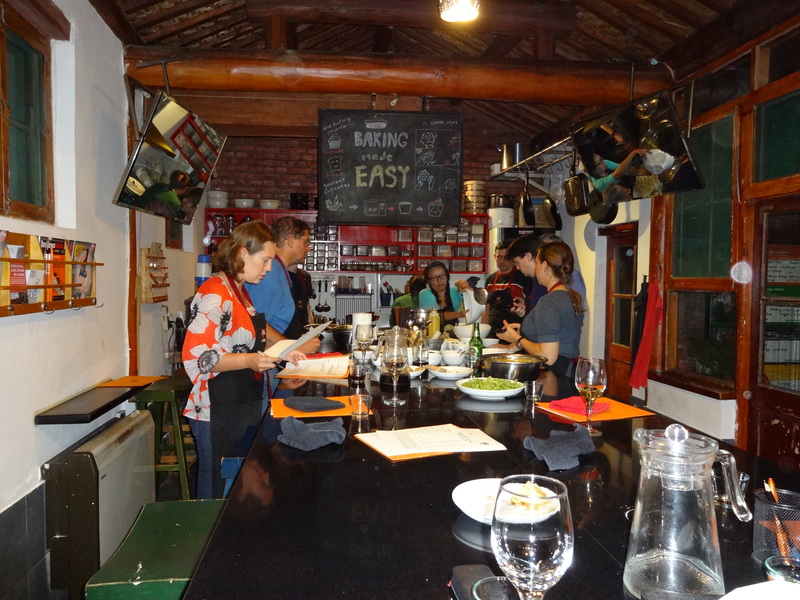 The Hutong cooking school is a cultural exchange center. 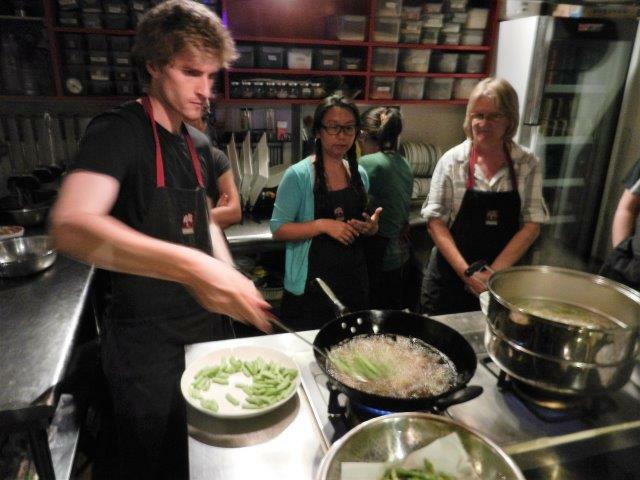 The cooking classes themselves were ¥300, about $45 for each of us. It was well worth it and we all had a good time. Liz had an upset stomach for the next two days which she thought was from the spicy food we cooked. Although we felt like failure after two months of weekly tutoring, we did have a Pieco phone app to show Chinese characters and some survival phrases from Will. We had no idea about how well we would be able to communicate. After all, if a Chinese word is even slightly mispronounced, it is an entirely different word. Settled in our seats on the sleek bullet train in the Beijing South Station, we suddenly had a communication problem. 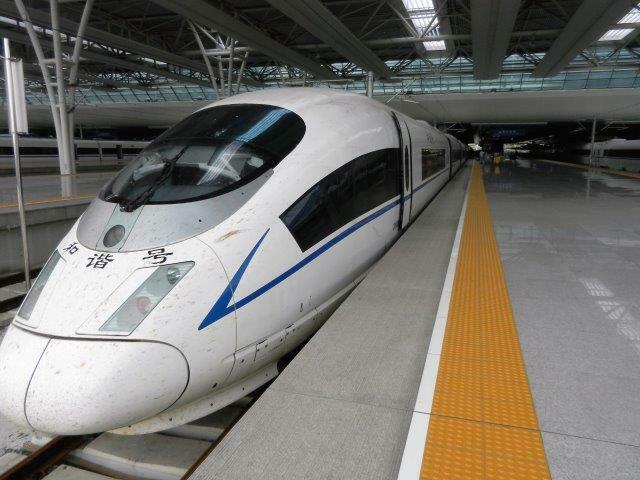 There were only a few minutes to launch and a young man asserted in broken English that we were in his seat, maybe on the wrong train. We ran off the train, but on the platform, realized we were on the correct train in the assigned car, and passed the young man leaving the train, having realized his error. 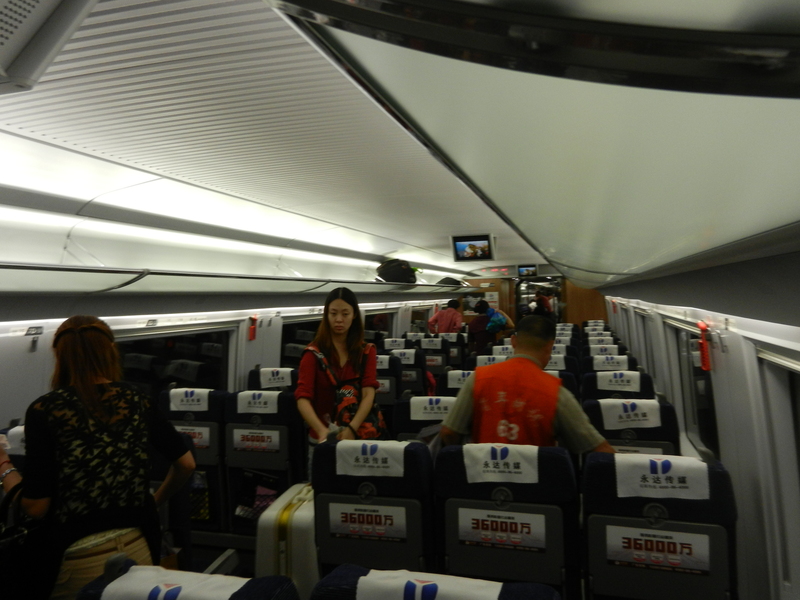 Back in our seats, we found ourselves speeding at over 300 kilometers per hour for the five hour trip to Shanghai. 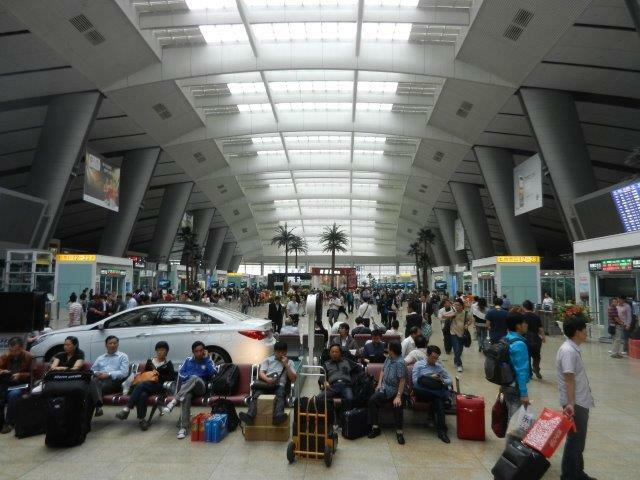 We knew to just walk by the men offering a taxi inside the Shanghai Hongqiao station, saying, bù yào, don't want. 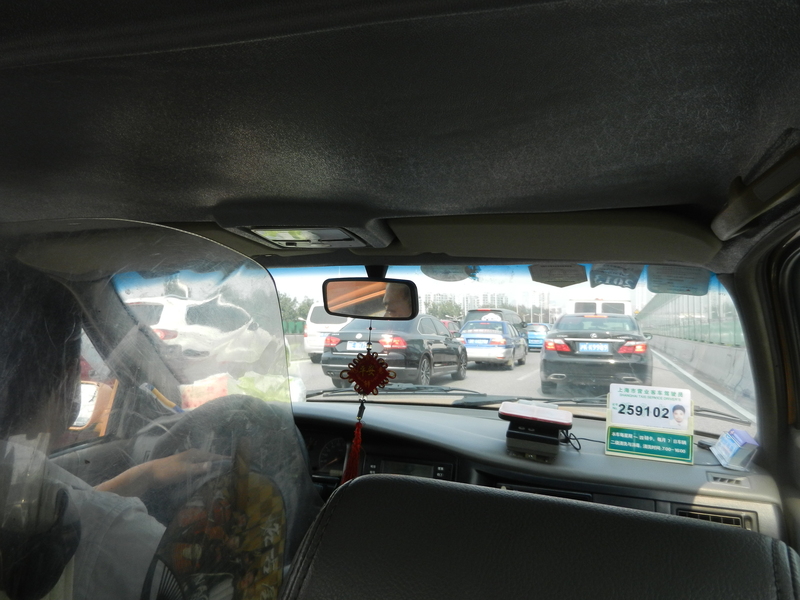 The queue for the legitimate taxis was almost empty, and after giving the driver our "taxi card" with the location of the Indigo Hotel in English and Chinese, we quickly found ourselves moving slowly on the elevated highways in Shanghai heavy traffic surrounded by a forest of tall buildings. Much to our surprise, the driver stopped next to a tall public building, holding his hand out signaling "we're here." No hotel was in sight, and a check of the Google Maps using the cell phone GPS showed us in People's Square, a couple of miles from the hotel. Shaking my head, I pointed to the map on our taxi card, and the driver repeatedly pointing to the Chinese print, declaring, 这是地方你印在这里, which we did not understand. 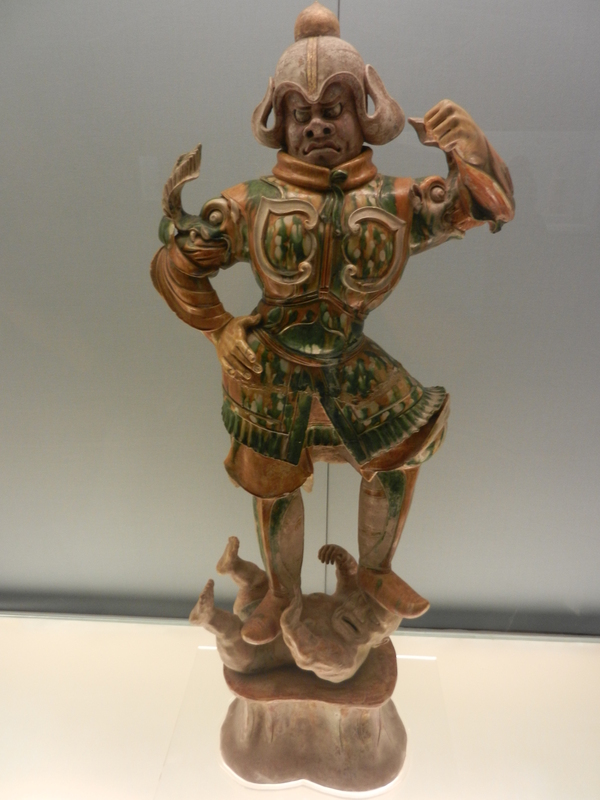 Eventually, the Google map on the cell phone convinced him of that our hotel was not the Shanghai Museum. 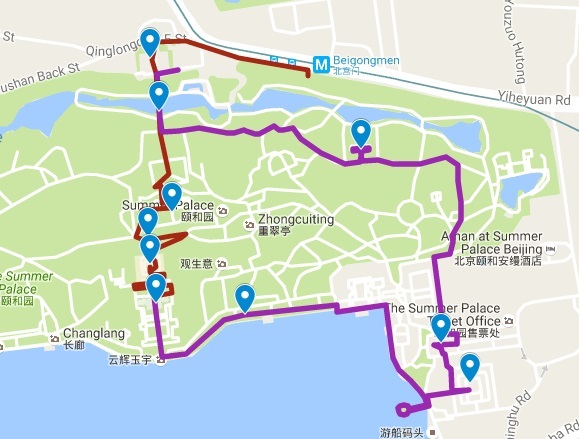 I later learned that Chinese characters on my taxi card were for the Shanghai Museum, although the map, English and Pinyin for the Indigo Hotel. We arrived at our hotel, with the driver talking and laughing with the doormen, we apparently were stupid Americans. After checking into our hotel, we walked 15 minutes to nearby Cool Docks and found a restaurant for dinner. 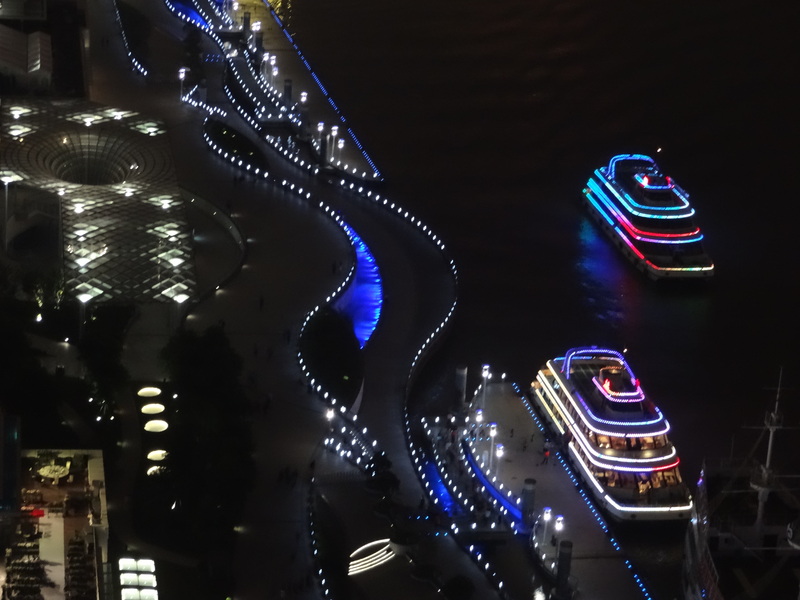 Then, we walked north on the sidewalk on the river, trying to figure out from our taxi-cards where we could find a boat ride. We were actually looking for P.J. 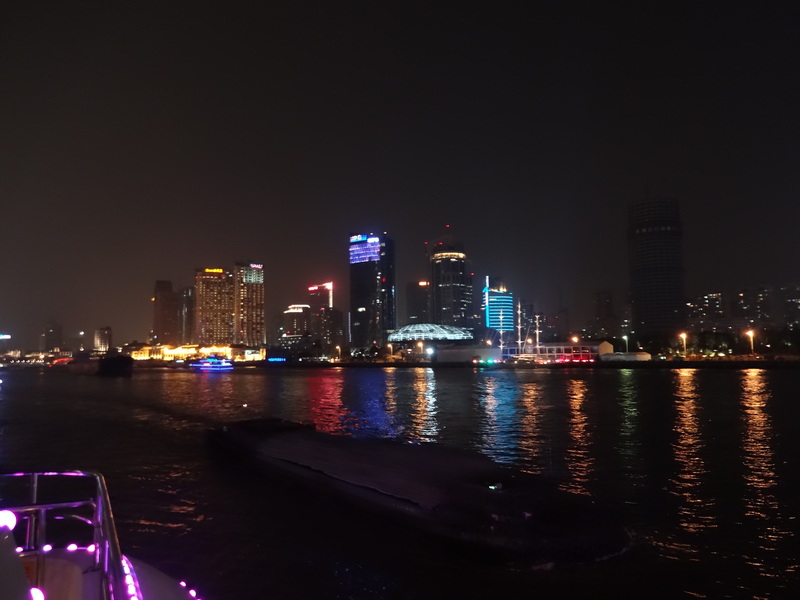 River Cruise, but on the way to their address, 127 Zhongshan Dong Er Lu, a man beckoned to us with "Boat ride? 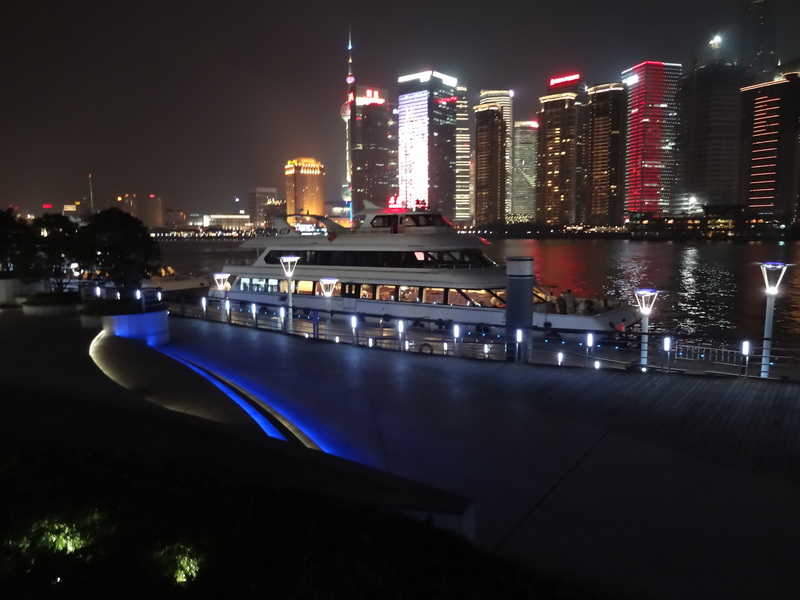 "� With just about no words spoken, we followed along, and we soon had tickets and were in line for a Huangpu River Cruise. It seems that lot can be said with a few words and gestures. It turned out we were at the Haungpu River Tour ticket office, which turned out to be fine, because after a short wait, we were aboard a very nice boat. 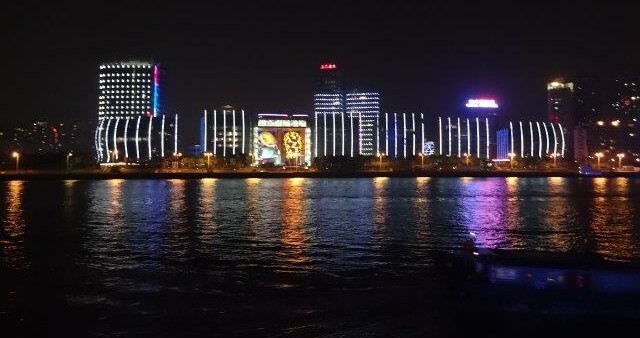 On the boat, we could see the Hotel Indigo where we were staying, the tall building with the blue lighting. 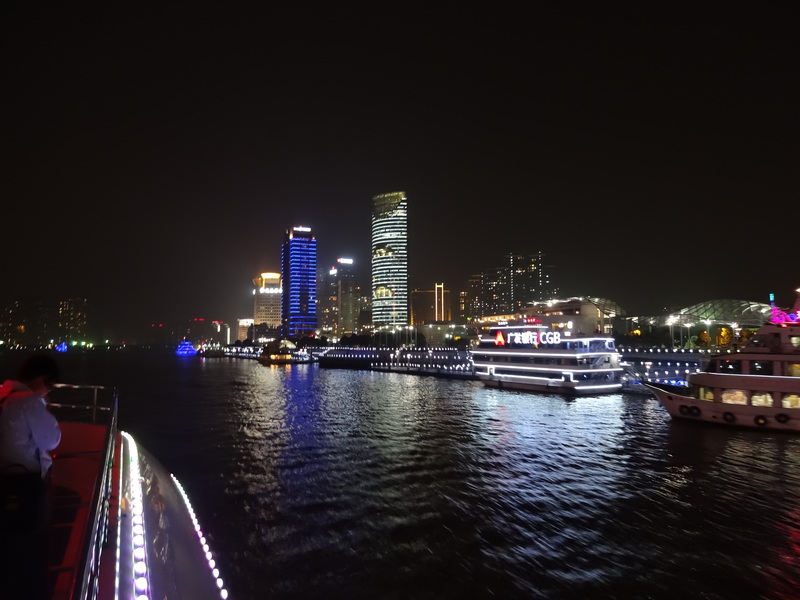 On the west side of the Huangpu River was the Bund, with buildings from the early 1900's. Someone told us that they turned out the lights at 10 PM. We waited past 10 PM to see the lights go out, but that did not happen. 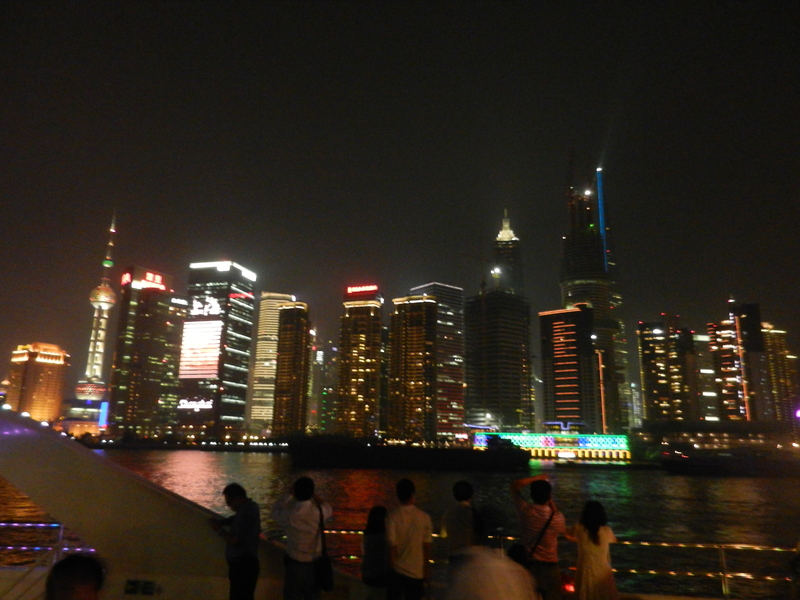 On the east side of the Huangpu River were some of the world's tallest buildings. Chinese people were generally nice, and seemed to like Americans. On the boat, a middle aged man who was speaking Chinese to his friends, asked me with gestures, to have his picture taken with me. After doing so, I gestured for him to take our photo. That was easy. Our hotel’s concierge was very confident in his speaking of English., but he only got about 70% of that we were saying.. He did not understand very well, yet he believed that he understood. We tried to tell him that we preferred to use the Subway, but he continued to give us taxi directions. He remained focused that what he was saying was right, not listening to what we wanted to say. At least he circled some areas that we wanted to see on a map. 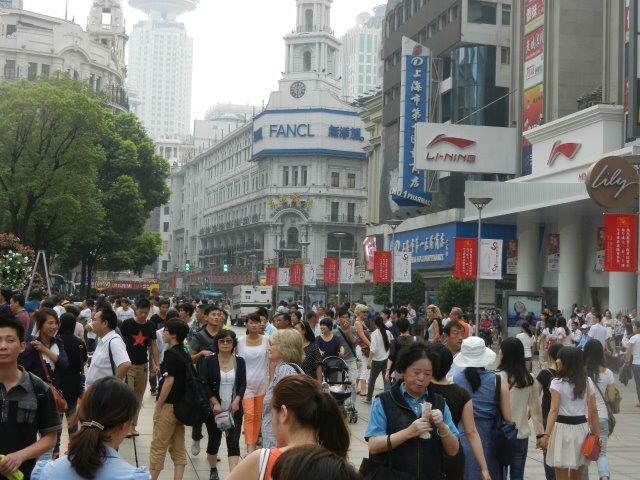 We walked out onto the busy Shanghai streets, squeezing through a congested sidewalks.Crossing the busy streets were death defying experiences, so we would join a group of people hoping that a vehicle would not take out a crowd. 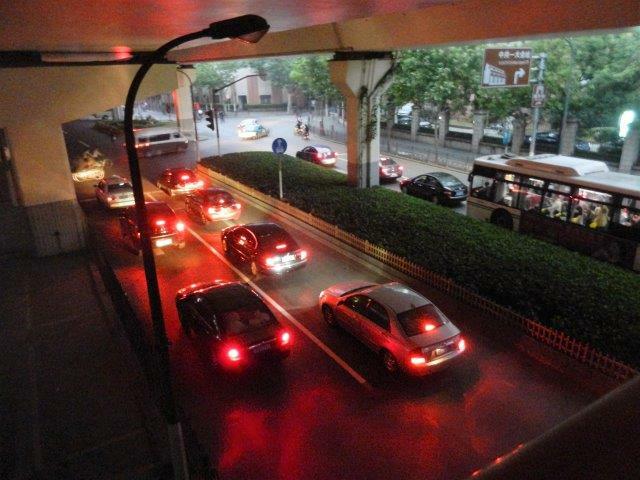 In China, cars have the right of way, and many drivers consider a red traffic light as a recommendation which they disregard. 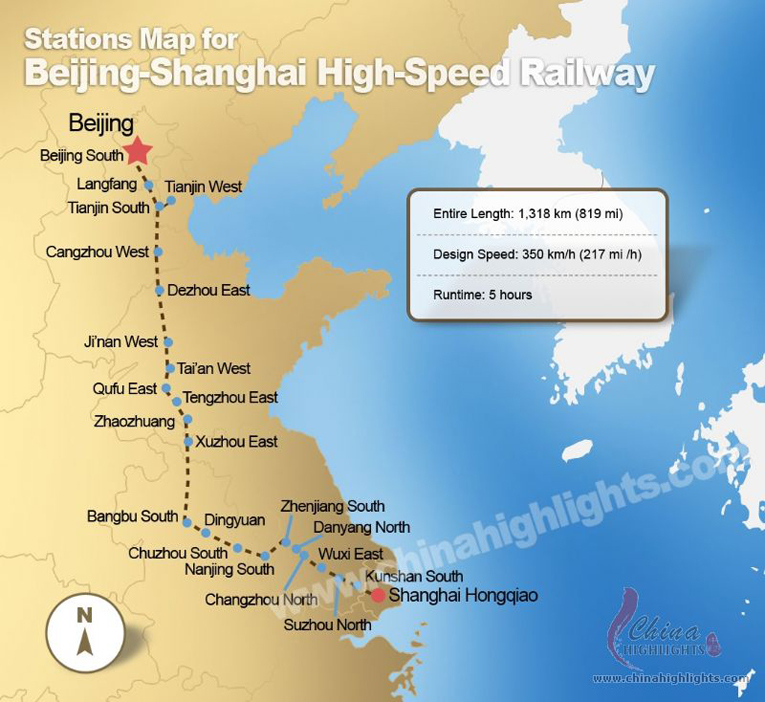 The Shanghai subway was divided into zones, which involved different fares if the zone boundary was crossed. Although here were instructions in English, it was confusing. 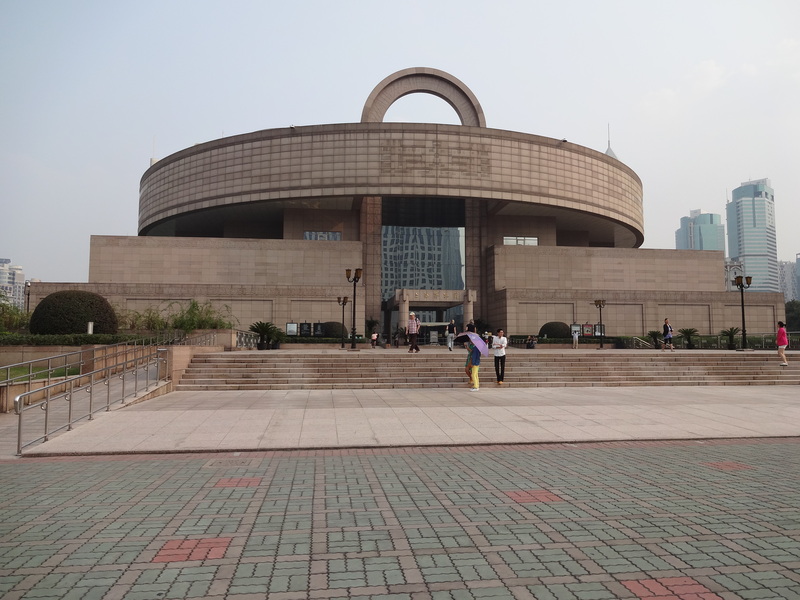 Between Google Maps on our cell phones and the posted subway map, we were able to make our way to the Shanghai Urban Planning Exhibition Hall. 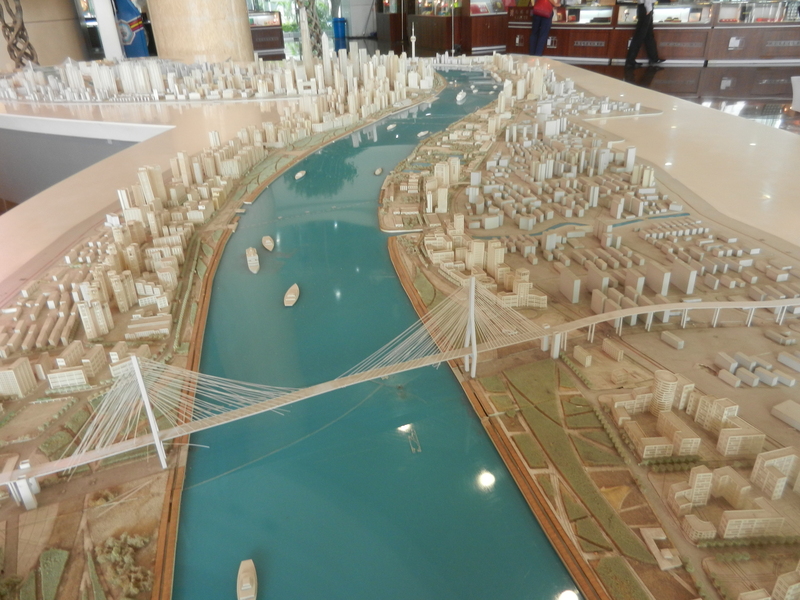 There were exhibits on how Shanghai had developed and a 3-d map of the city. The Shanghai Art Museum was a short walk from the Urban Expedition Hall. 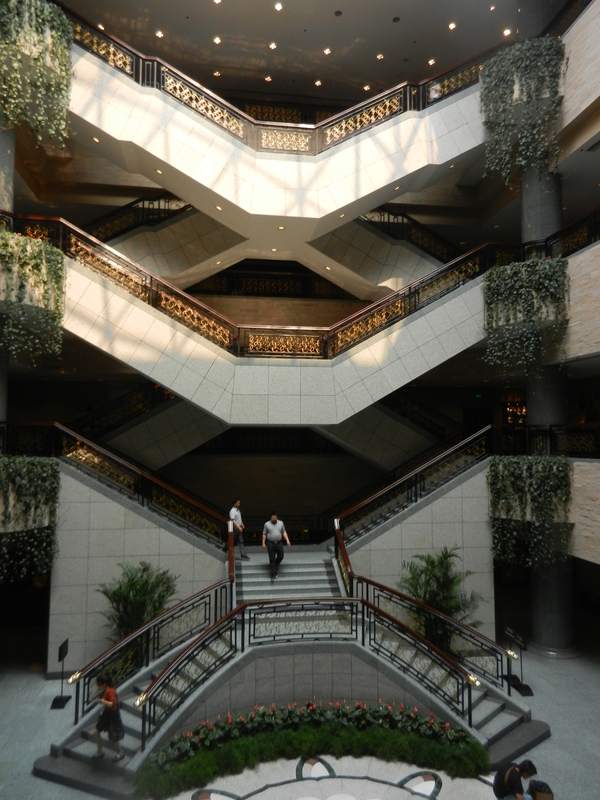 On each floor, there were two different wings each showing art from different eras of Chinese history. Outside the museum, a Chinese woman who spoke English helped us understand the subway system. 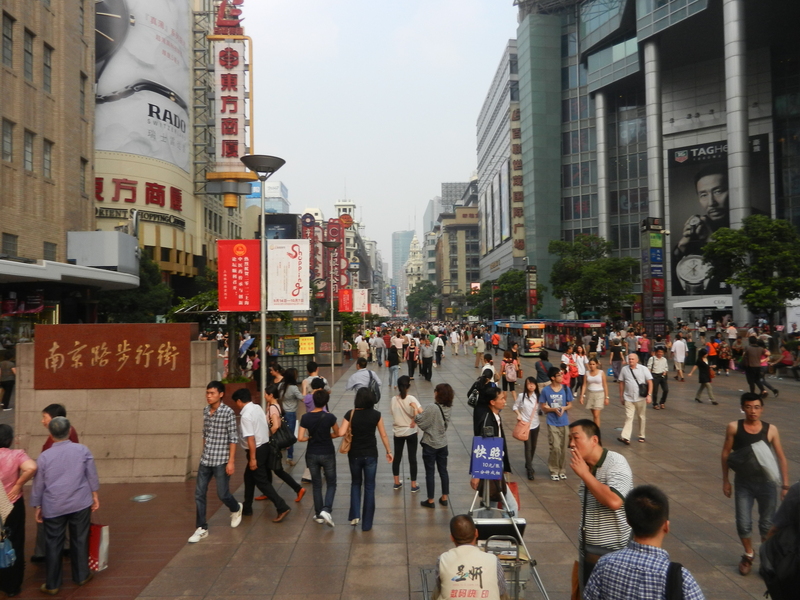 It was about a 15 minute walk from the museum through People's Park to East Nanjing Road. 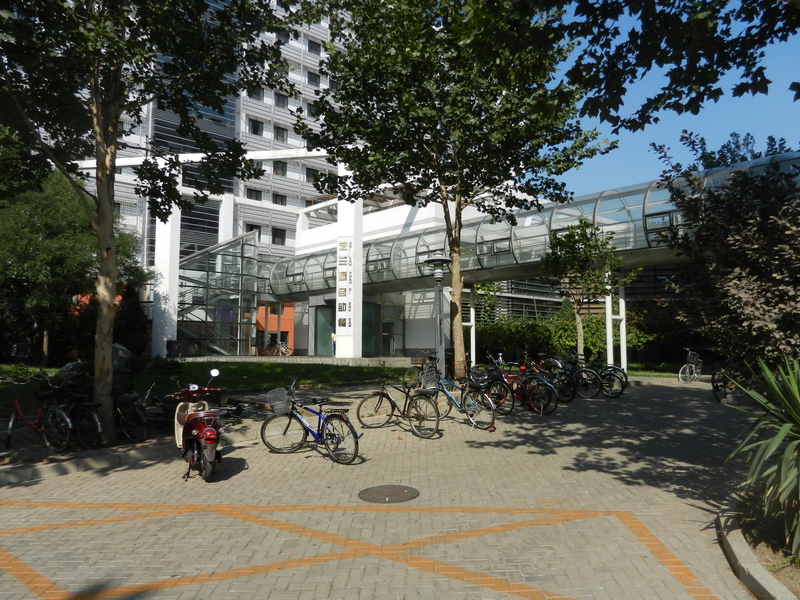 The street was made into a pedestrians walkway. 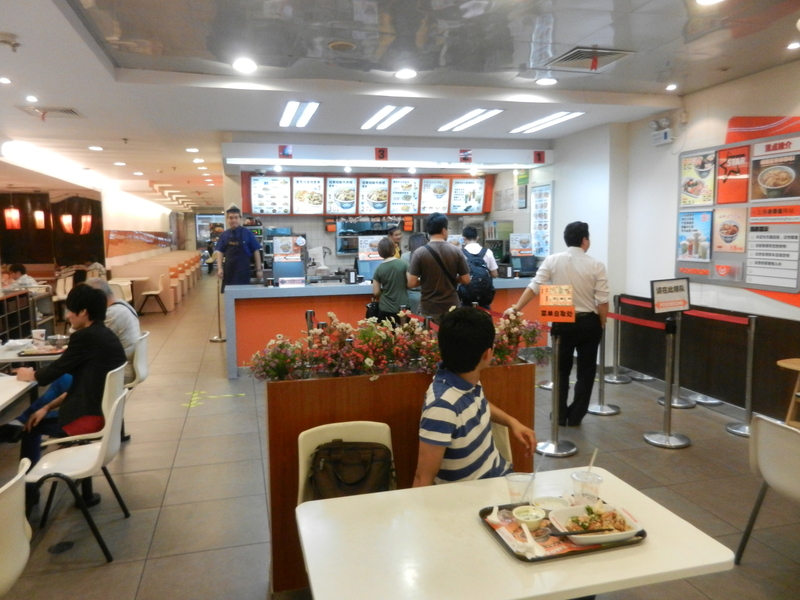 We found a Chinese fast food restaurant. It looked like a McDonalds, but served bowls of rice topped choices of stir fry vegetables and meat. We each got a bowl for a late lunch, but it was not very tasty. 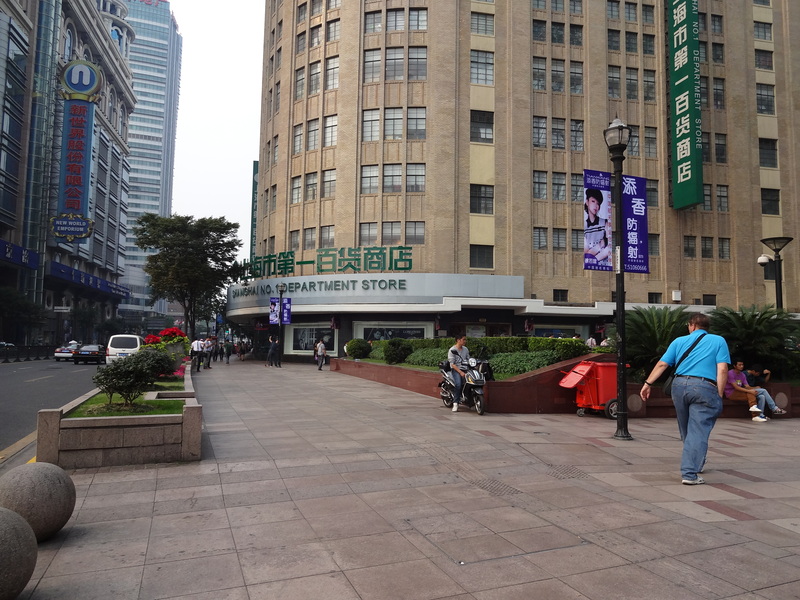 In the Number One department store, I did not understand the red circles with the number followed by 折, for example 5 折. I I would try to ask, and two different sales ladies showed me, with the calculator, multiplying the prince x 0.5 to get a discounted price. This did not act exactly like a percent, but I did not know how to ask. And the sales ladies did not say anything. Later, I found on the Pieco app that the symbol, zhé, meant fold, break, or bend, but it was also used to indicate discount. We were unable to think of a polite gesture to ask where the bathroom was. The elevators in the Number One department store were misleading, showing a universal restroom symbol for every floor. 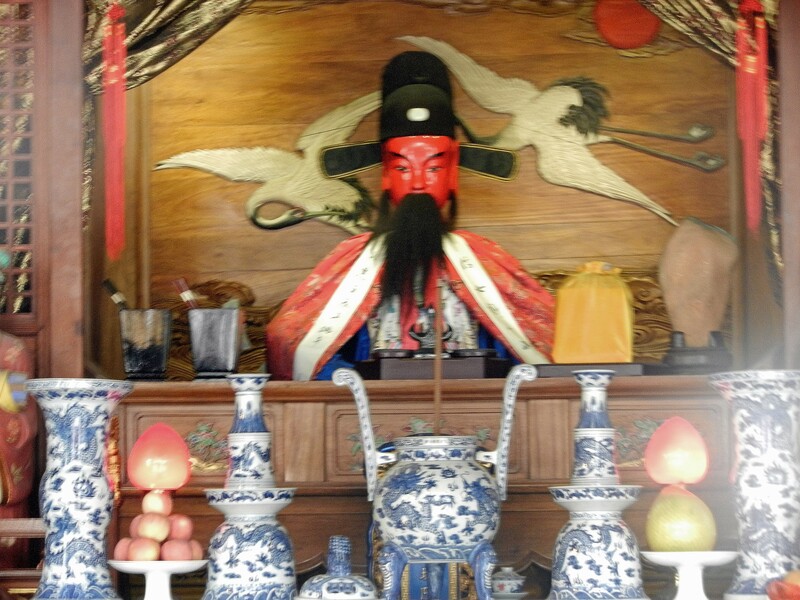 After a search for the periphery did not show a rest room, we had to ask a sales lady, “Qǐngwèn, xǐshǒujiān zài nǎ'er?” (Translation: please ask, bathroom, where is, in the Beijing dialect?) 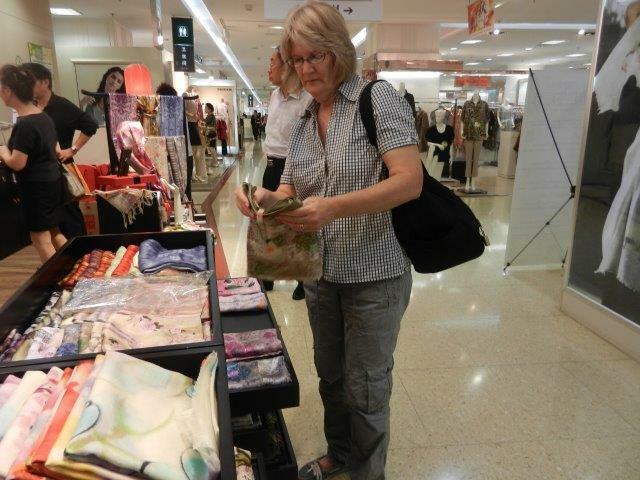 The sales lady pointed and answered in rapid Chinese, 浴室在二楼，去自动扶梯两个航班，左转，走在墙壁上. We gave her a xièxiè, thank you, and off we went in the direction of her pointing, confused with her words, but something about the èr lóu, second floor, which is where we found the bathroom. 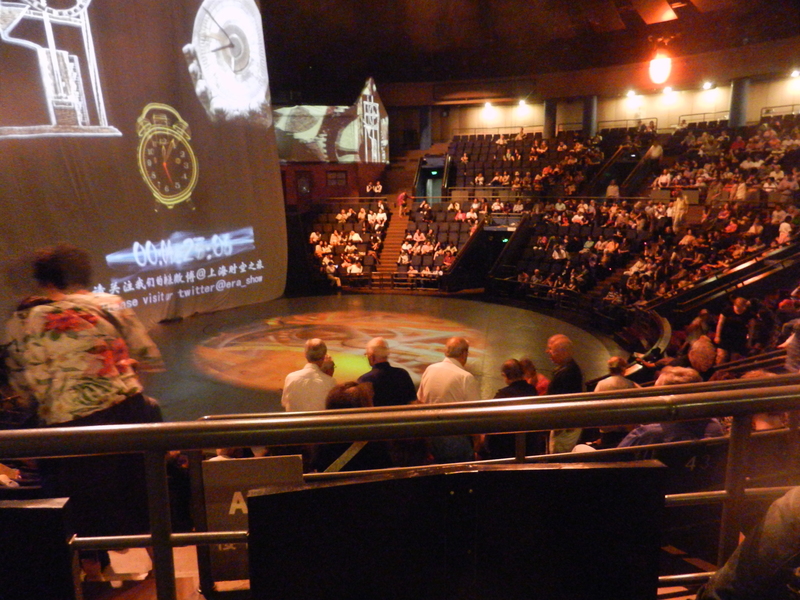 In the evening, we attended a show at Shanghai Circus World. I took a photograph of the arena before the show, as photographs during the show were not permitted. The show was a lot like Cirque Du Soleil with acrobatic dancing, climbing, flipping and rope work. The exciting climax was watching a motor cycle inside a metal ball being joined by other motor cycles, one at a time, until 8 motor cycles were all driving inside the metal ball. Many Chinese did not even attempt verbal communication. Going into the City Gods Temple, the man sitting at the entrance just looked at us, and then pointed to the ticket window. I was curious to see what a city god looked like. 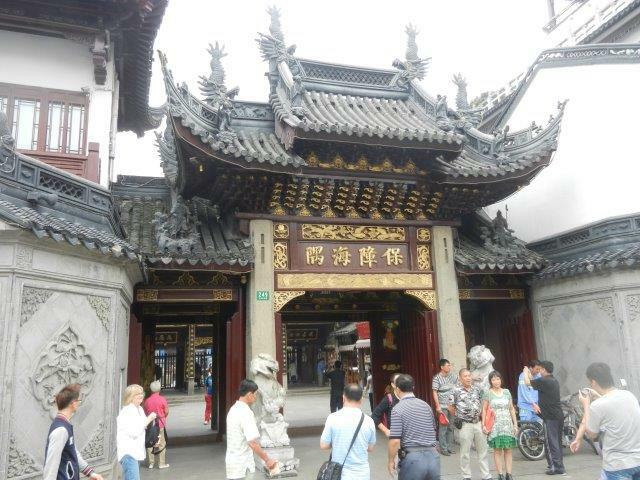 We walked thought the temple to see statues and busts of numerous people from Chinese history, each with a Chinese and English inscriptions. At the Hall of City God, there was an inscription, "Shanghai City God Qun Yu-bo (1295?-1373 A.D, jinshi in Zhizheng period (1341-1367) of Yuan dynasty. Took success for administering seaside of Eastern Sea. 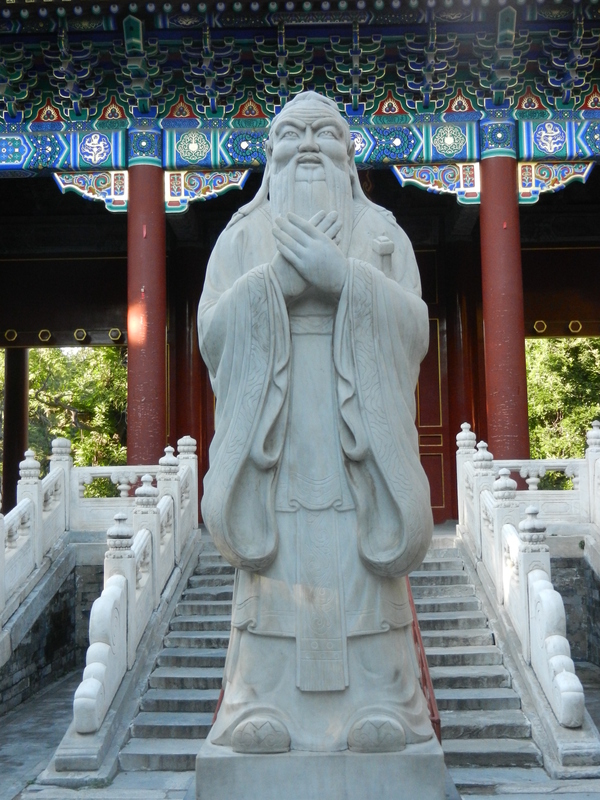 After Quin's death, Ming Tai Zhu made him the City God of Shanghai. 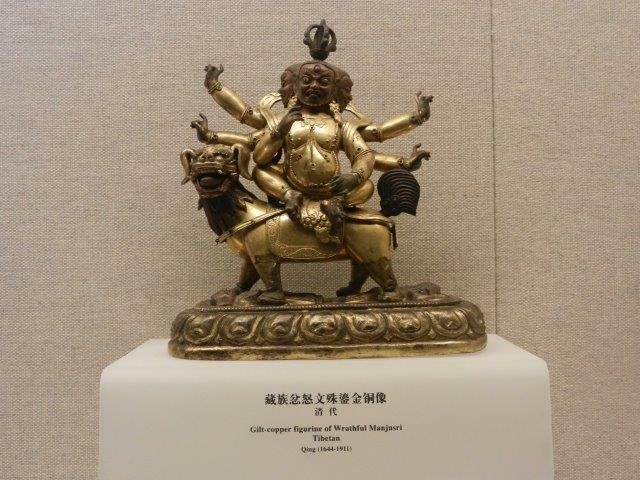 Madame City God is offered sacrifice with Quin in the same hall temporarily. City God safeguards the welfare of the town and the country, protecting the lives of the masses." 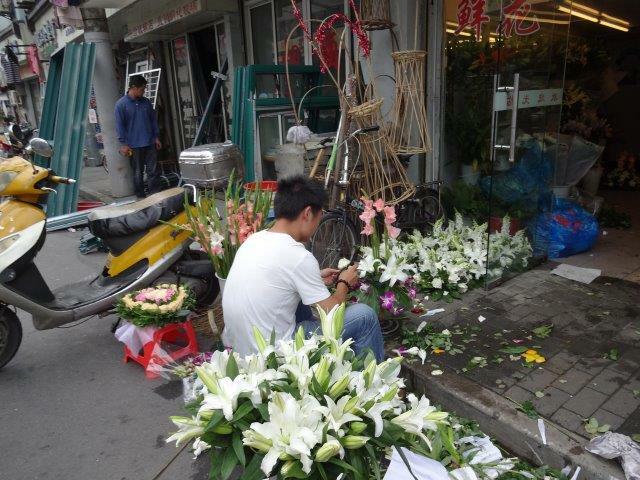 It seems that in China, dying is no excuse for missing work. 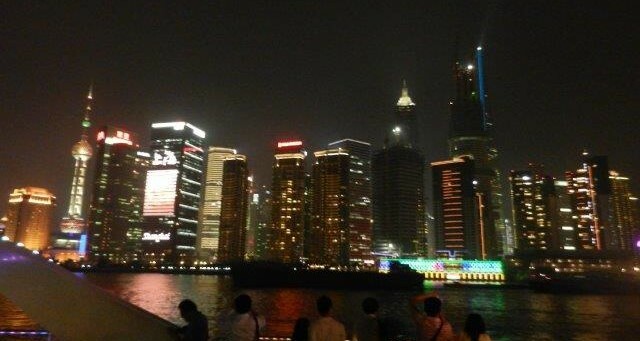 It seemed that there were a lot of people in Shanghai that spoke a little bit of English. Numerous people trying to sell items on the street started with, "Hello, hello." There were some who recognizing us as Americans, would say excuse me and thank you in English. Saying something understandable in Chinese did not help when the answer was in Chinese. In a souvenir store in the Yu Gardens Bazaar, a sales woman repeated, hello, hello. I responded with, wǒ suí biàn kàn kàn (I’m just casually looking), and was answered with a rapidly spoken Chinese, 这很好，环顾四周，有很大的讨价还价各种纪念品. All I could do was say, wǒ tīng bù dǒng, literally, I listen don’t understand, while walking away with her still talking. This was a problem, because saying something correctly in Chinese led to an assumption that we knew Chinese when they spoke back. In a pearl store, I complemented a college-aged saleswoman on her English. We talked and she told me she learned English in school. I tried to speak my English a little slowly, which helped her understand She did not go to college, her family only had enough money to send her older brother to the University. She and her younger sister only had a high school education. 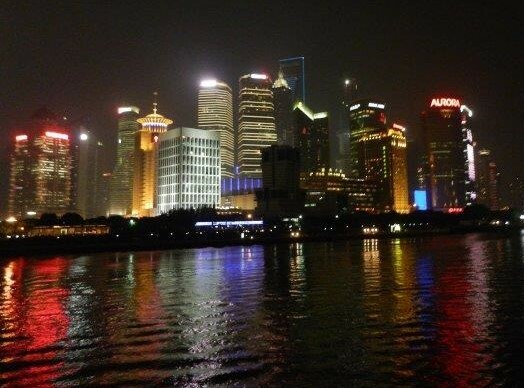 She spoke of how it was nicer in Shanghai than Beijing, but she had never been to Beijing. She explained that she had to work all of the time, and did not have time for holiday She told me that she needed to speak in English for her job, so she studied on her own with the help of a machine where she could look up new words. I asked how she did with verb tenses (since Chinese verbs do not have tenses), and she said she just used short sentences so she would not have to use verb tenses. In the tea stores, we found one young worker who spoke passable English. She even countered my tài guile, too expensive, with, “This is the price I give to my cousin.” Her two co-workers were pleased at my efforts to speak Chinese. They gave me the thumbs up when I finally pronounced ten (shí, said with tongue curled for the sh sound) for the wait time in the dumpling line. 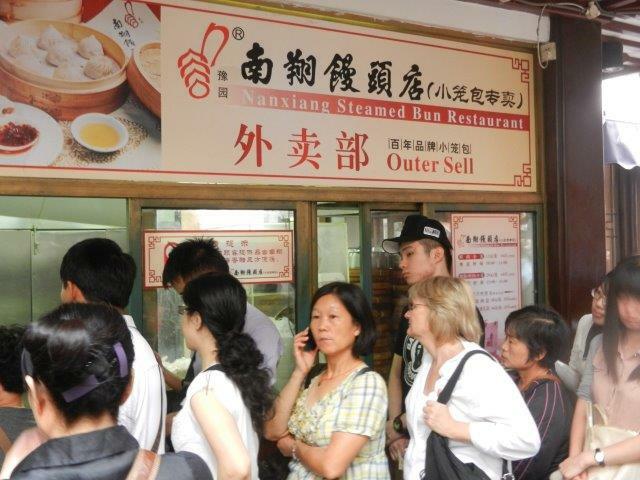 Liz waited in line to buy steamed dumplings in the Yu Garden Bazaar. We were told that the steamed dumpling shop was really good. 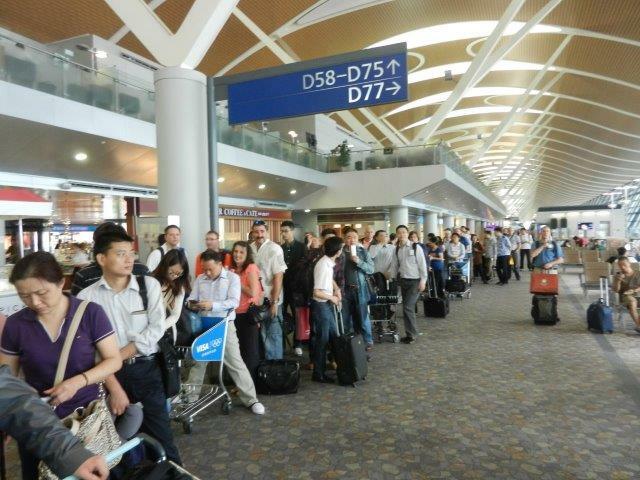 The proof was the long line of Chinese people waiting for them. The line was next to a pretty water view at the entrance of Yu Gardens. The dumpling were delicious. 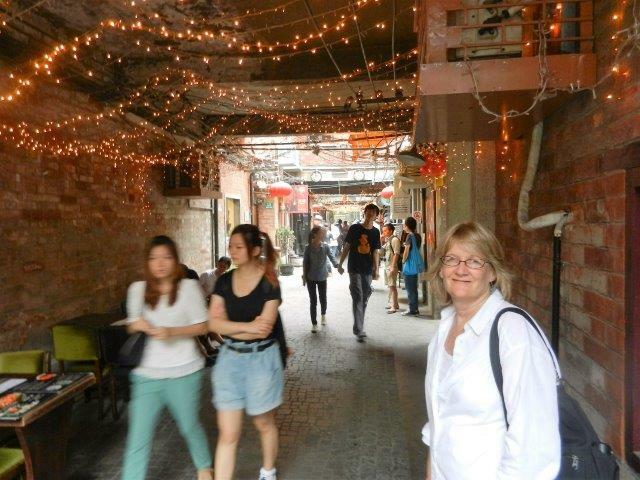 We took the subway to Tainzifang, which was an arts and crafts enclave. 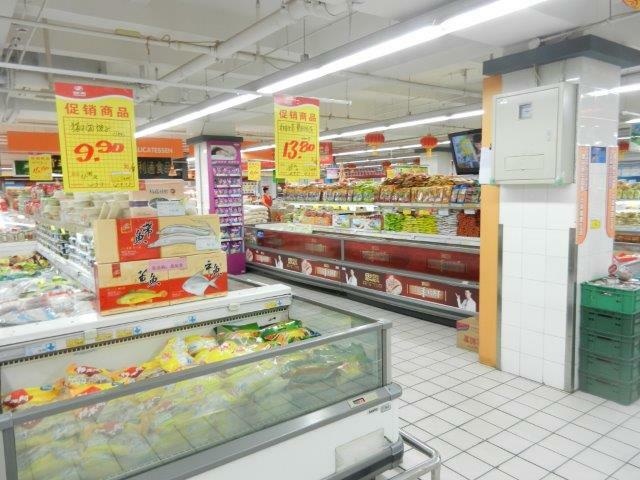 There was a supermarket on the level of the subway station. We noticed that there were fresh fish, so fresh in fact that they were still swimming in tanks in the market. 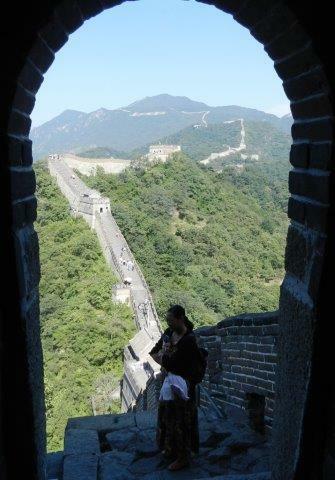 Tainzifang was not visible from the major streets, but found a sign on a narrow alleyway pointing to the enclave. We walked thought alleyways of Tianzifang, which had some restaurants and shops. We found some some interesting items here and there. We walked down South Hangpi Road, which was near French Concession. It reminded me of the some of the streets in Manhattan. Thanks to Will, we did not starve. We did not enter restaurants unless we saw pictures of what they served. 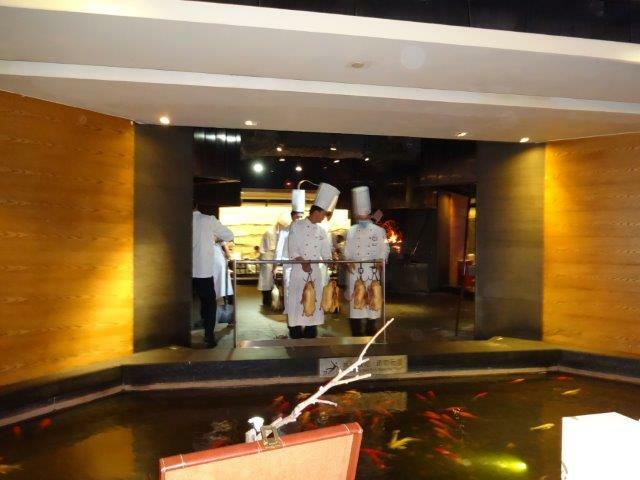 Many of the waiters did not know English. 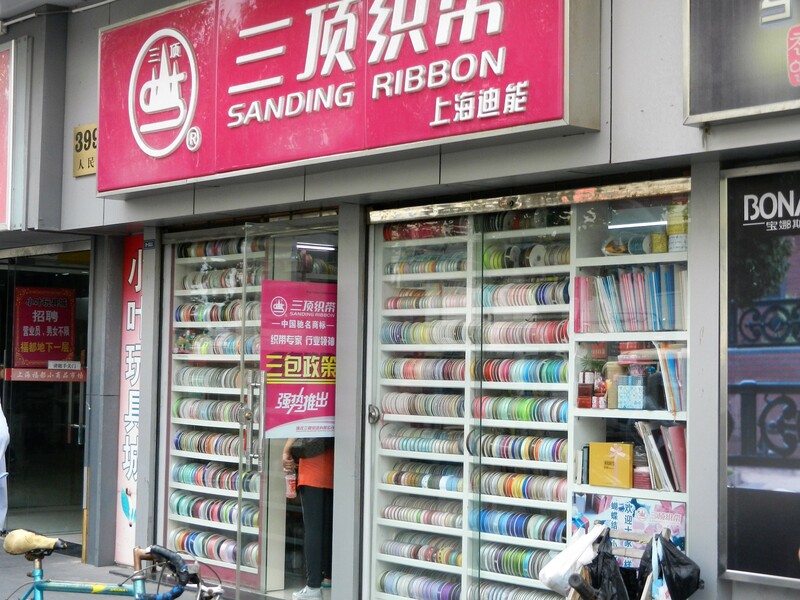 We knew to say càidān, for menu, and píng shuǐ, for bottled water. 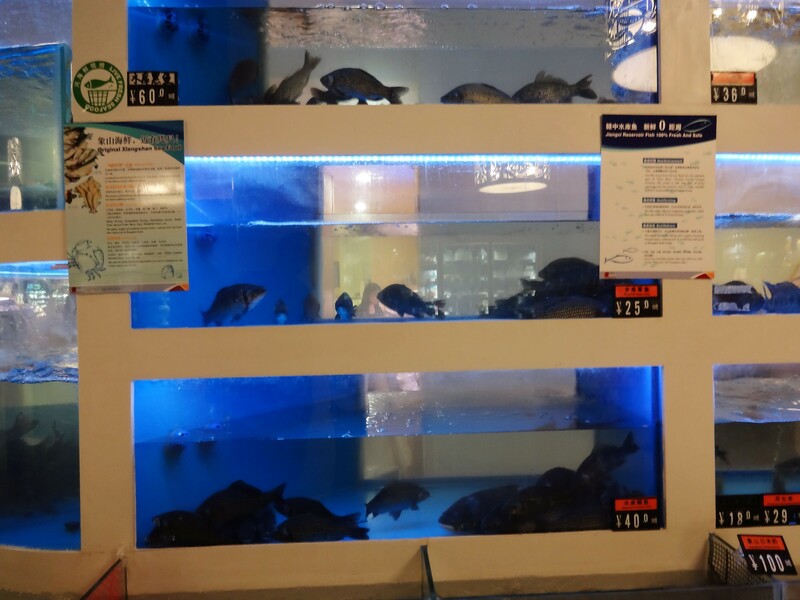 (In one small restaurant, we tried asked for báishuǐ, plain water, and were given a carafe of boiling water. The Chinese have to boil their tap water before drinking it.) Fortunately, menus had English and Chinese, and we could point to items saying, zhège, meaning “this.” We learned we had to ask separately for mǐfàn , cooked rice. We had our last meal at a different restaurant in Cool Docks. We ordered Kung Pao Chicken again, but this had a distinctly different wonderful flavor than the same dish outside the Yonge Lamistary in Beijing. As we ate, we watched a wedding that was going on across a small pond of water. A waitress tried to give us a set of western utensils even though we were doing fine with chopsticks. When we were finished, we asked for the zhàngdān, mening, bill, but the waitress corrected me with, máidān, meaning, the bill in a restaurant. It helped to learn the correct word, but most of the Chinese were too polite to correct me. We finished the day with drinks on floor 30 of the Hotel Indigo We toasted to our great time in Shanghai. 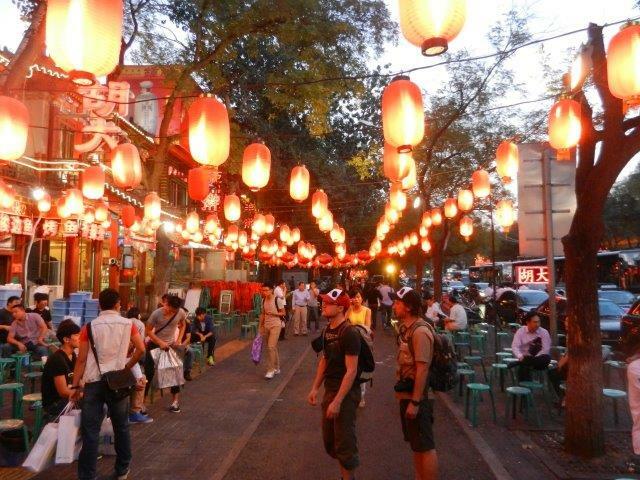 Shanghi is a lot like New York City, with tall buildings, narrow streets, and shops everywhere. 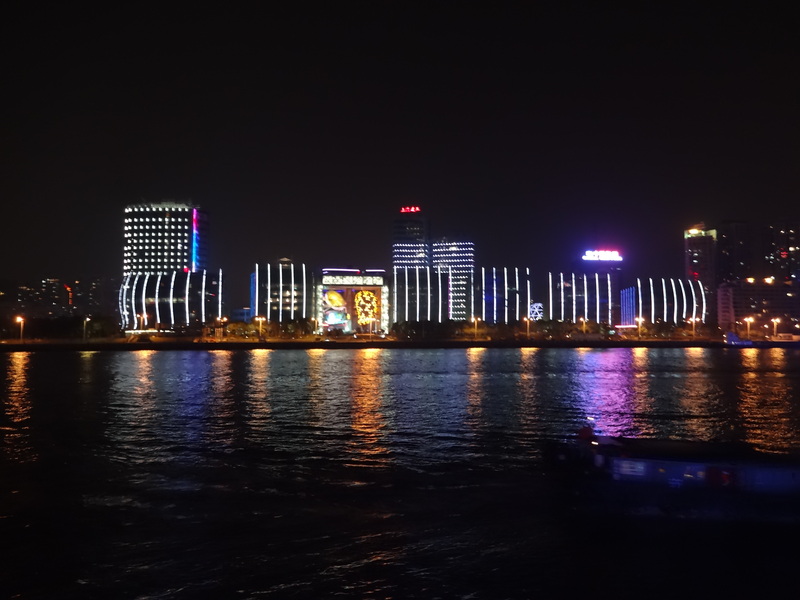 Shanghi has layers of history, such as the 80 year old buildings on the Bund from the time of the spheres of influence, to the many modern skyscrapers on the other side of the Haupang River. Shanghi is the place where you can buy everything, and it might be nice to return someday to get lost in the endless shopping. 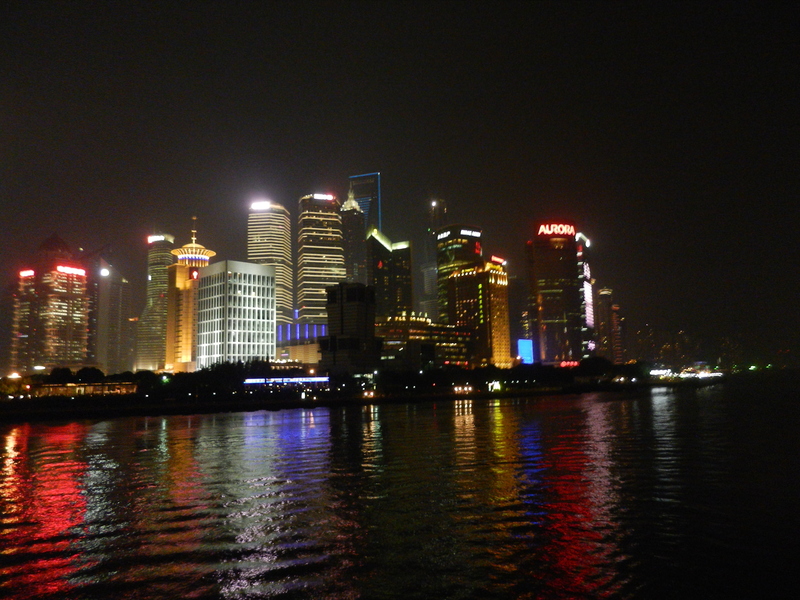 We departed Shanghi at 10:00 AM on Delta flight 180, which arrived 14 hours 15 minutes later the same day in Detroit at 12:15 PM. 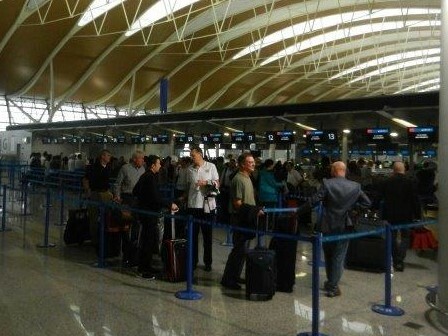 During customs, the agent asked what we were doing in China, and had to put up with my explanation about how Beijing was like Washington DC and Shanghai was like New York City. 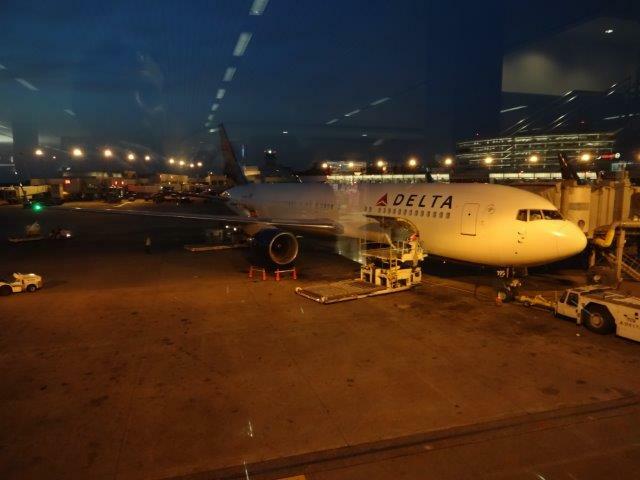 We then took Delta flight 2007 which left Detroit at 3:35 PM and arrived in Atlanta at 5:40 PM.